Sail Aboard the Mary E! 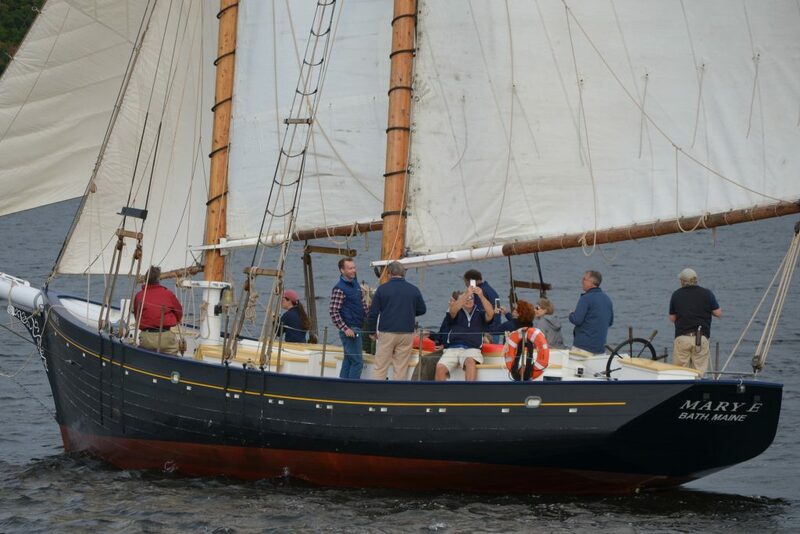 Starting June 5 we are excited to offer sailing trips aboard the 1906 schooner Mary E! 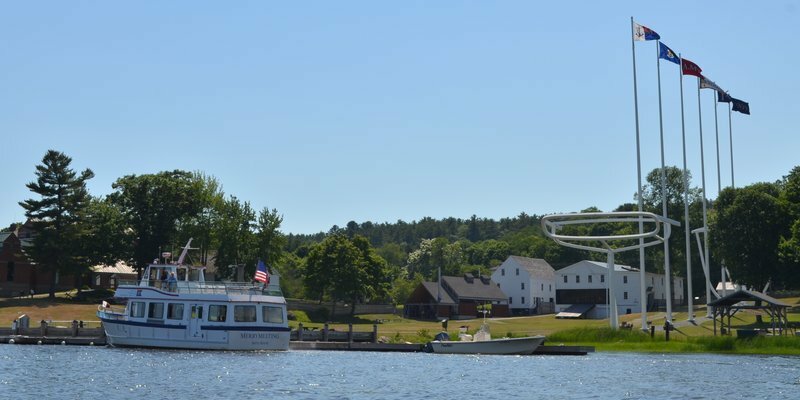 The 2.5-hour Mary E Kennebec River Sail and Lighthouse Adventure will be offered Wednesdays, Fridays, and Saturdays at 4 pm (June 5-September 28). 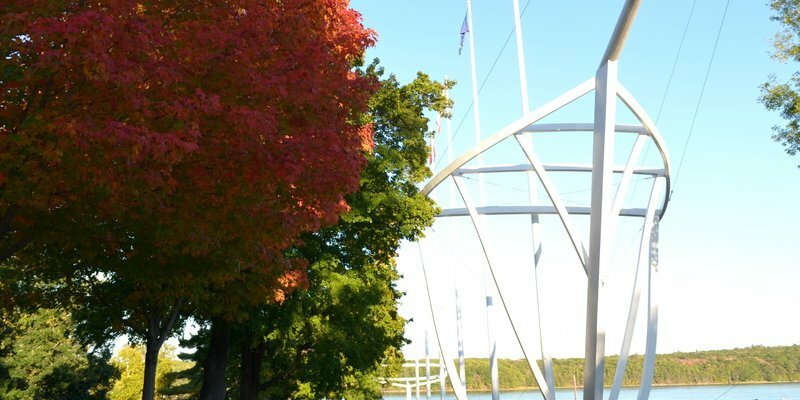 You’ll sail past the site where Mary E was built and launched in 1906, get an up-close look at the river’s iconic lighthouses, and maybe even help the crew set and trim sails! The museum was recently named as one of ” New England’s 10 Unmissable Historical Sites” by Fodor’s Travel! We are honored to be included with the other outstanding organizations selected. Other recent accolades include being named the best museum in Maine by USA Today in 2018. 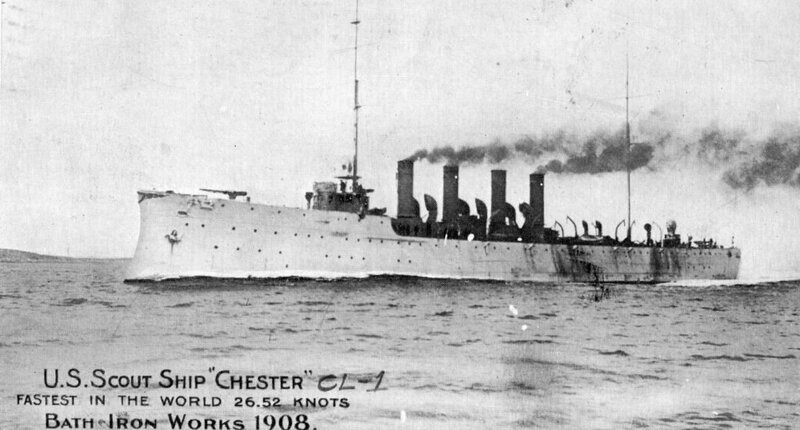 111 years ago this week at Bath Iron Works, Edward O. Cutler was calculating how much it would cost to install an automated potato peeler in the scout cruiser USS Chester. Calculating materials, labor, and company profit, he estimated $186.06 for the project. Register for Kennebec Explorers Day Camp! Registration is now open for our super-fun summer day camp! 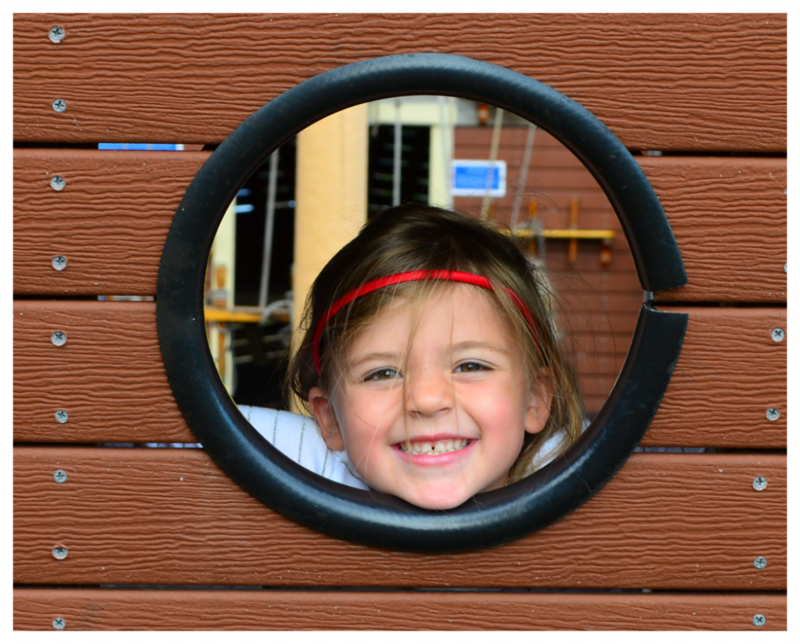 Campers enjoy nature exploration, beach trips, crafts, cruises, and more! There are seven sessions of our five-day camp available. Learn more here! February is the month when the price of a dozen roses triples and boxes of chocolates begin to line store shelves. 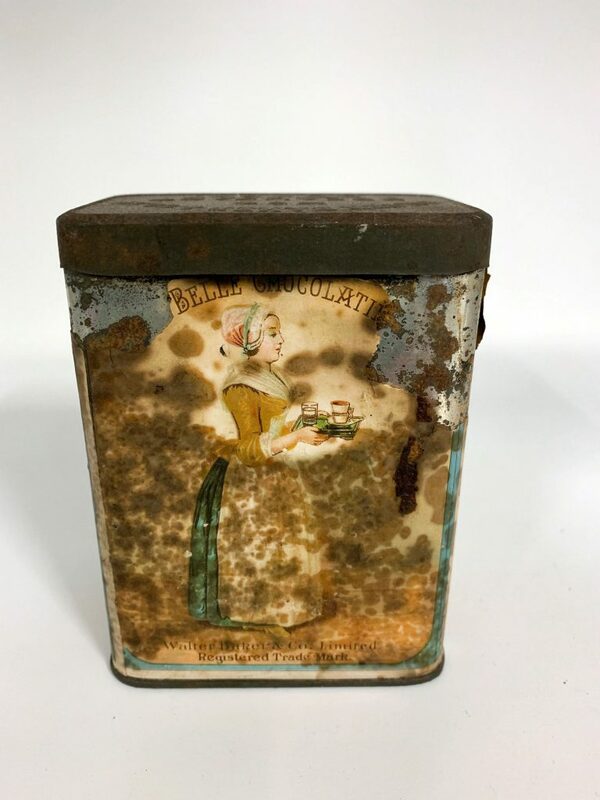 Chocolate has been the candy of choice for generations of valentines. But why? The answer lies in a nebulous web surrounding the perception of luxury items, innovative marketing, and the power of cultural trends. Sailor’s Valentines: It’s the Thought that Counts? 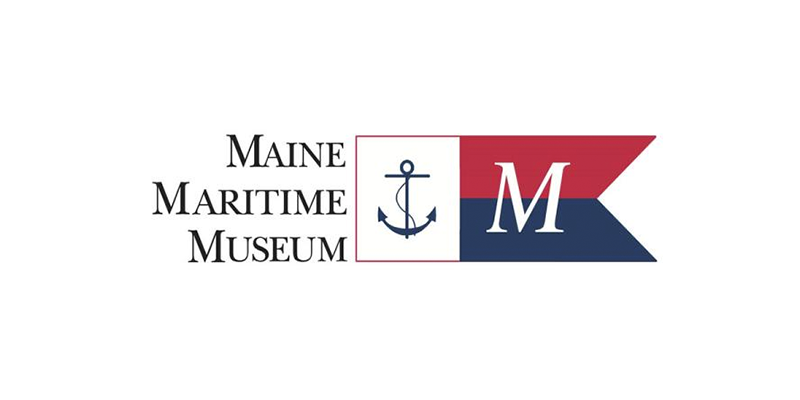 Maine Maritime Museum is joining other museums and cultural institutions across the country in offering FREE admission to federal employees and their immediate families during the government shutdown. This is Maria Murphy’s description of Christmas at sea on the Bath-built ship Shenandoah in 1896. Her husband, Jim, was the captain. Their 19-year-old daughter, Jane, and 17-year-old son, Wilder, were also aboard; Wilder, who had grown up at sea, was working as third mate. Give Local Kids the Gift of a Museum Visit! This holiday season, the museum is excited to partner with Big Brothers Big Sisters of Bath/Brunswick to provide museum experiences to children in local communities. Your gift of only $10 will sponsor one child and their “Big” to spend the day at the museum any time over the next year. Mary E’s First Summer at MMM a Success! 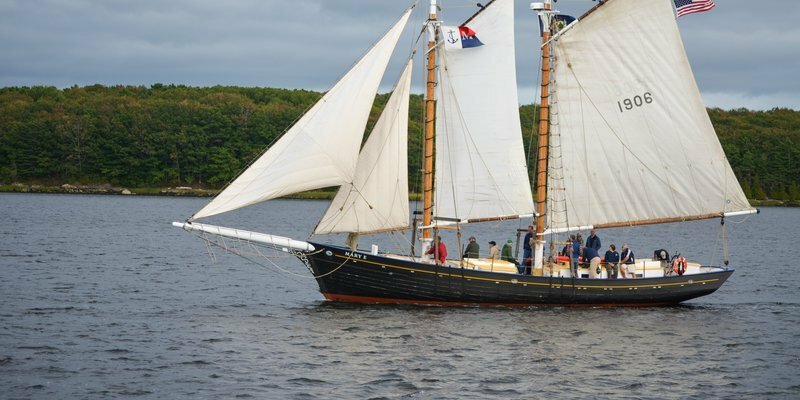 The newly restored schooner Mary E had a busy and successful first summer at MMM, welcoming thousands of visitors on board at our docks, visiting Boothbay and Portland, and even competing in her first race (she won second place)! Would you like to win this beautiful painting? Purchase a raffle ticket and you may! 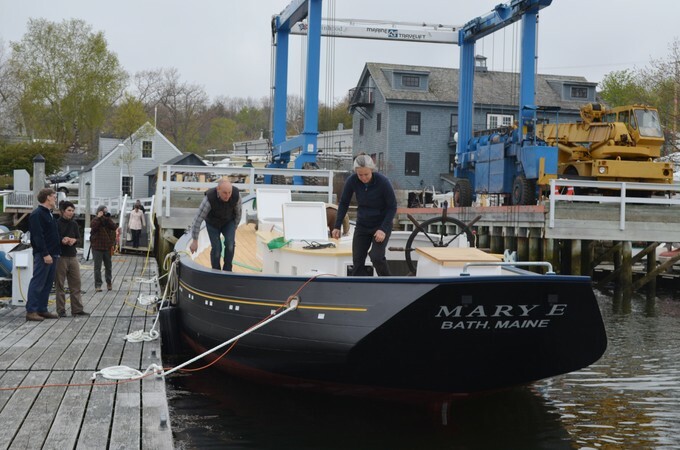 Putting Mary E on Stands by artist Robert Beck commemorates the restoration of the Bath-built 1906 schooner at Maine Maritime Museum during the summer of 2017. (Original, 12″ x 16″, oil on panel.) You may remember Beck’s work from our 2016 exhibit Over East, an Artist’s Journal: Paintings by Robert Beck of the Contemporary Maritime Community. Mary E was launched at Derecktor Robinhood Marina this morning! After swelling in the water for a week or so she will motor to the museum so that work can be completed. Shipwright Andros Kypragoras checks out the new engine. Work on Mary E is ramping up as we gear up to celebrate her recommiosioning in June! Last week her engine, a 6B 210HP Cummins diesel generously donated by Cummins Northeast in Portland, was installed. Mary E‘s deck is now complete, and tjhe shipwrights have started constructing deck structures. Shipwright Nick Totaro fastens a deck plank on Mary E. The pine planking comes from a stand of trees planted in Vermont in 1904. 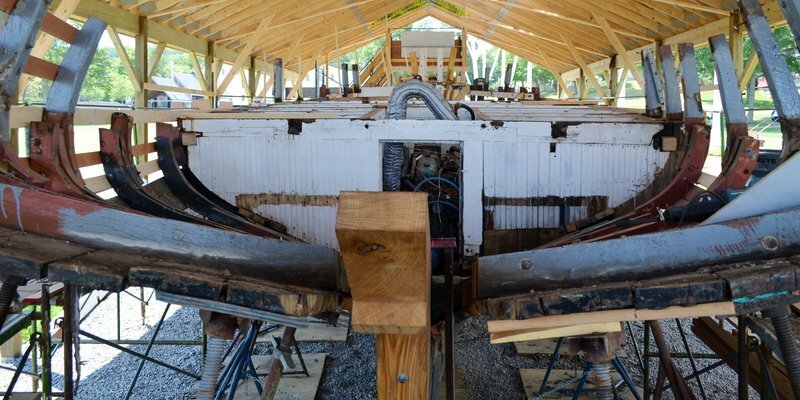 Mary E is moving along quickly, and soon the shipwrights will begin building the deck structures! 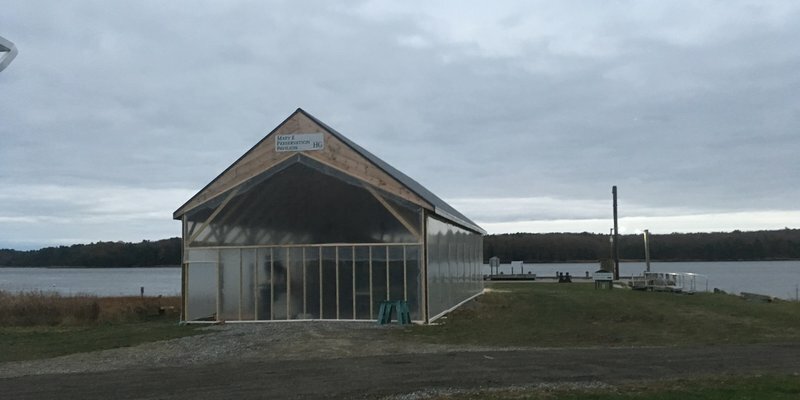 To create a slightly more comfortable work environment for our shipwrights, the Highland Green Preservation Pavilion has been shrink-wrapped for the winter. Unfortunately this means that the restoration will not be accessible to visitors during the winter months. We look forward to opening the pavilion to guests again when the weather warms up this spring. Shipwrights assess the first section of beam shelf, just bent and clamped into place. Each side will be made of three pieces scarphed together. The beam shelf is 4” thick white oak, steamed for 4 hours so it can make the bend. Shipwrights fair the insides of the frames in preparation for setting the beam shelf. The beam shelf is a longitudinal beam that supports the deck beams. Because of the length of Mary E, the beam shelf will be made of three pieces on each side of the hull. 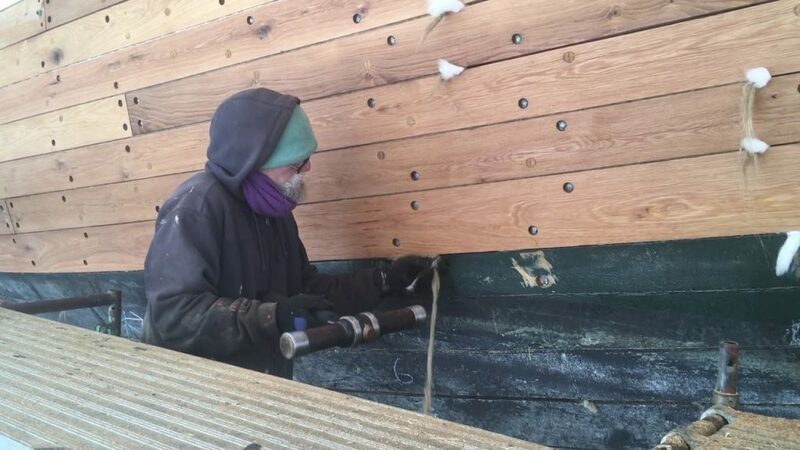 Shipwright Aaron spiles the shutter plank on Mary E‘s starboard side. The shutter plank is a plank that fits between two other planks that are already fastened to the vessel. Planking often goes on from the bottom up and the top down simultaneously, so there is always at least one shutter plank per side. The shutter plank requires different techniques to clamp it to the vessel because the framing above and below it is less accessible due to the other planks bring there. 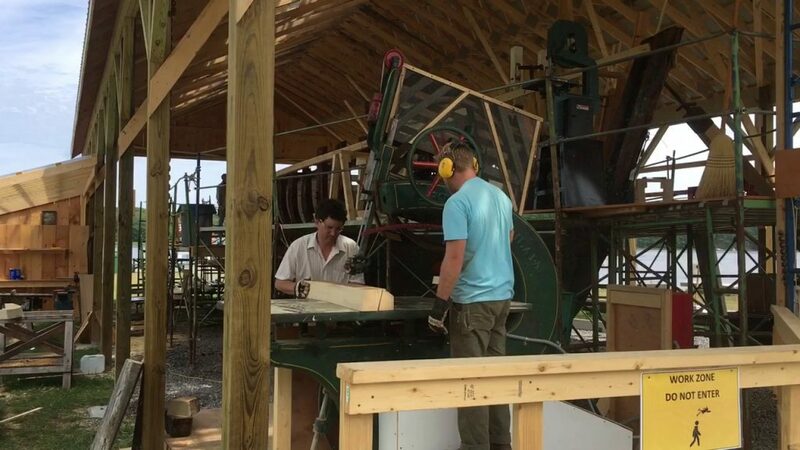 Boatshop volunteers mill a Mary E hull plank to thickness. Some planks came from white oak trees felled at Butler Head Preserve in North Bath. Mary E shipwrights cut a frame futtock using the museum’s ship saw. The saw was last used in the 1980s during the Apprenticeshop era, and was meticulously restored by museum volunteers over the winter of 2017. Circa early 20th century, the saw was manufactured by the L Power company of Philadelphia. A ship saw differs from a traditional working bandsaw in that when cutting bevels on a piece of wood, the entire upper arbor tilts to the desired bevel, and the table stays flat. This allows large and heavy timbers to go through the saw on a flat surface. Great Island Boatyard and Kennebec Marine Services remove Mary E‘s engine with a knuckle boom crane. The GM engine will be replaced with a new factory reconditioned engine, generously donated by Cummins sales and services of Portland, Maine. 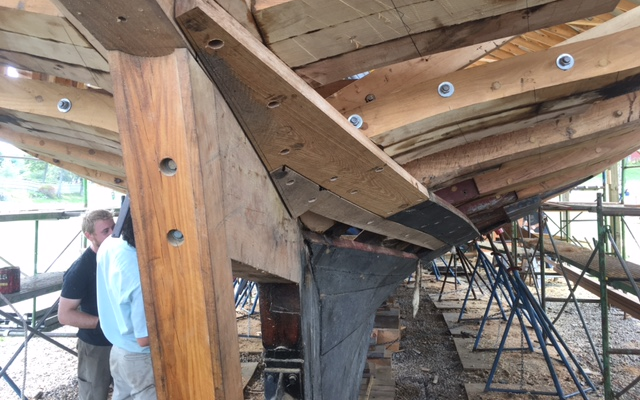 Five planks are fastened to Mary E‘s port side. Also visible is the bottom transom plank, fastened in place with galvanized wood screws. Where the hull planking meets the transom planking is a tricky miter joint, compounded by the necessary caulking bevel, which is barely visible. The shipwrights began planking Mary E below the waterline at the stern. 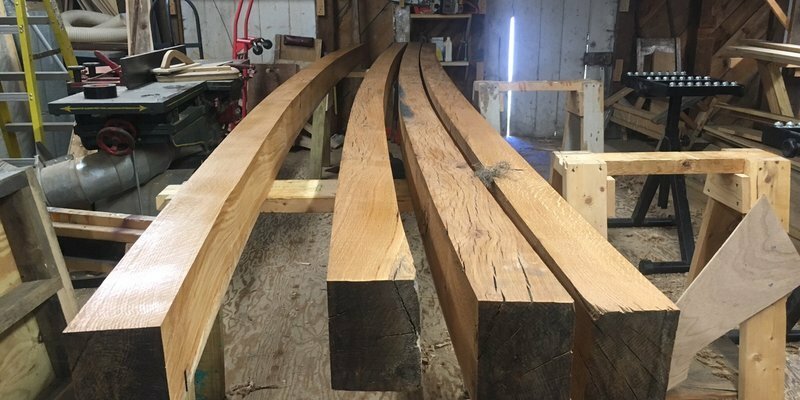 Many of these planks need to be steamed to allow the 1 3/4″ thick white oak planks to bend into position. The planks are fastened with galvanized spike nails and carriage bolts. At right, head shipwright Andros Kypragoras checks a bevel while making a new plank for Mary E. Each plank must have a caulking bevel to accept oakum which will tighten the joint, and a plank bevel to mate tightly to the previous plank. 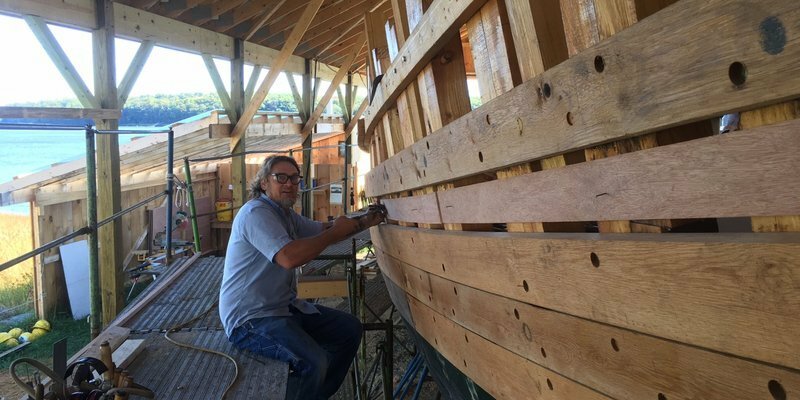 Shipwright Aaron Freeman fairs the stern framing in preparation for planking the hull. Planking is set to start next week! 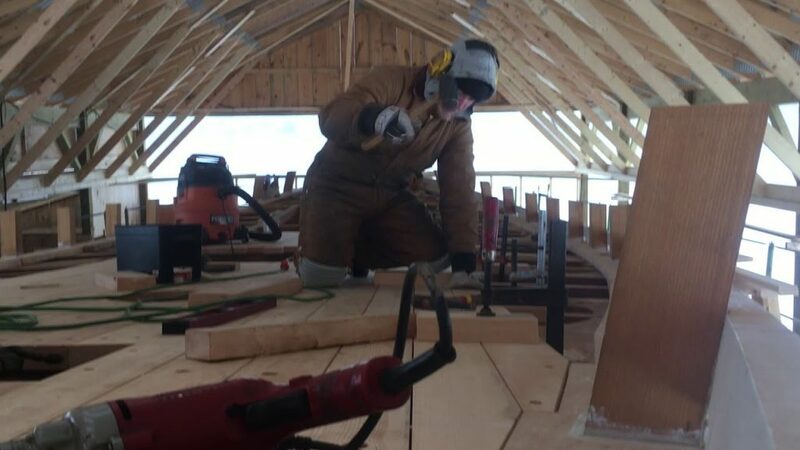 Shipwright Tim Clark fits the starboard knight heads on Mary E.
15-foot deck beams have been cut, planed, sanded, and oiled, and are awaiting installation sometime this fall. Another beautiful Maine summer has flown by, but don’t worry… we have tons of exciting programs and events planned for the fall season! Starting in September, a few of our favorite seasonal tours are back: Bath Cemetery Tours and Lighhouse Legends and Lore Cruises. 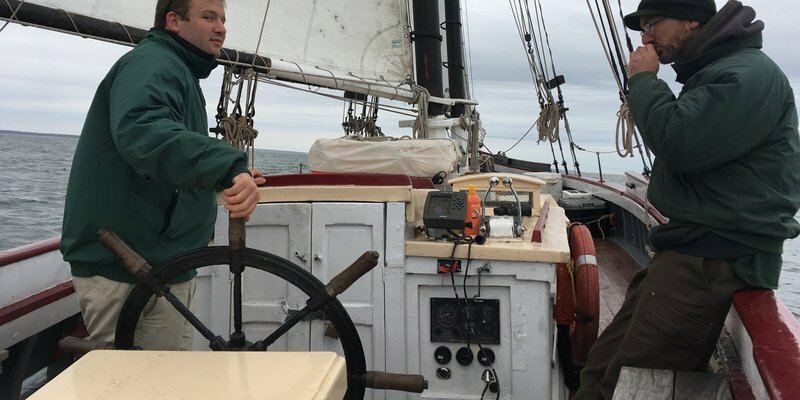 For both of these special programs we team up with Red Cloak Haunted History Tours to put a fun and festive spin on Maine’s maritime history. Tickets go fast, so book yours early! Master Shipwright Andros Kypragoras lays out a new deck beam for Mary E.
The deck beams and bulkheads are completely removed, and the new sawn frames are braced off temporarily to keep the hull symmetrical. Shipwrights are now working to frame the stern of the vessel, which requires stock with lots of sweep to it. Start your bidding! The 2017 Mariners Award silent auction is open! 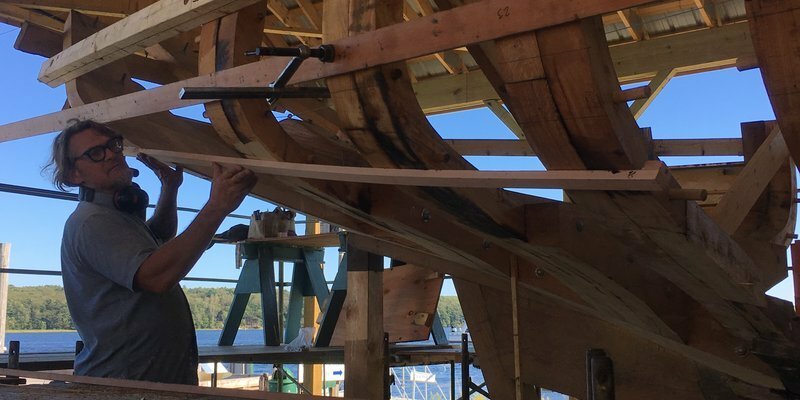 The 2017 Mariners Award ceremony, honoring the Maine Boatbuilding Community, is completely sold out, but even if you won’t be there, you can still support the museum by participating in the online auction, the proceeds from which help support our traditional skills and boating related programs. 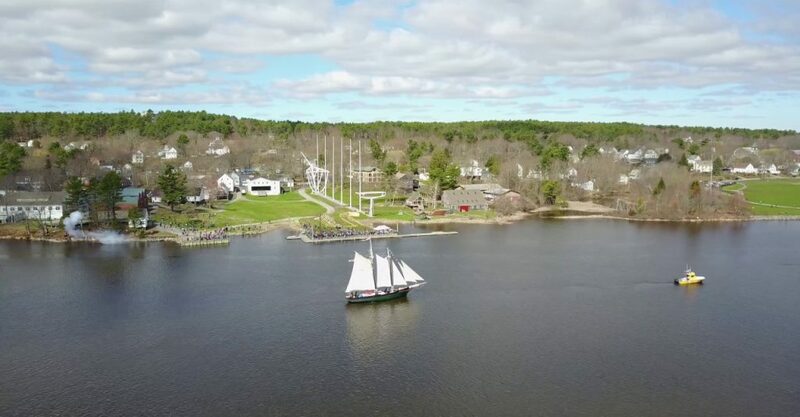 There are some awesome auction items available, including a sail on the Schooner Alert, private class in the Boatshop, passes to the 2018 Masters Golf Tournament, and more! The frame is almost complete for Mary E’s new transom. Work Continues on Mary E! Progress continues on the restoration of the Mary E! If you haven’t visited the museum yet this year, come get a bird’s eye view of the shipwrights at work from our observation platform! Great news! These long, summer days give you even more time to explore the museum! 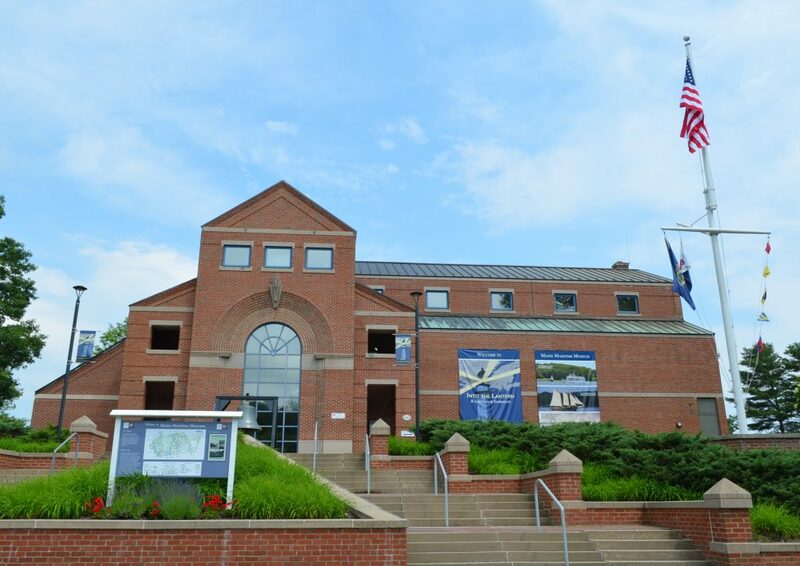 Starting July 3, the museum will be open until 7:30 pm Monday-Thursday. 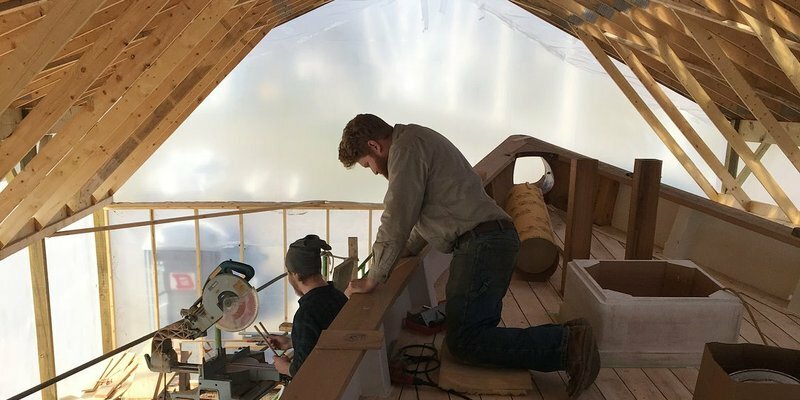 That’s an extra 2.5 hours to tour the historic shipyard, check out the restoration of the historic schooner Mary E, or experience the incredible new exhibit Into the Lantern. Just one more reason this is the BIGGEST summer ever at MMM… don’t miss it! Over the decades Mary E’s stern has dropped significantly, and for the first time in forever, she is getting a transom-lift. 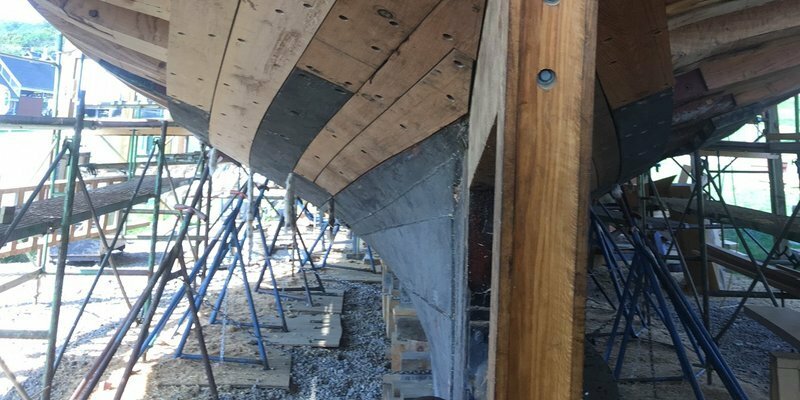 The shipwrights raised the bottom of her transom upwards of 12″ and will be building a new transom and reframing about 15′ aft. Initial plans included replacing the deck, the bulwarks, and some topside planks. Upon further review it was revealed that many deckbeams are rotted and must be replaced. In addition, the transom is sagging and needs to be lifted up and out of the water. This may require reframing the transom and the aft 15′ of the vessel. It’s our biggest summer ever! Summer is just around the corner, and we are so excited for the 2017 season! Visit the museum this summer to see all of our incredible new offerings, from the restoration of the historic schooner Mary E to our all new immersive lighthouse exhibit Into the Lantern: A Lighthouse Experience! Plus, this year we introduced a new tour By Land and By Sea: The Bath Iron Works Story, which combines the BIW Story Trolley Tour and the Shipyards & Lighthouses Cruise for the ultimate BIW experience. And of course, our lighthouse and naure cruises are running every day of the week. There’s truly something for everyone at MMM! 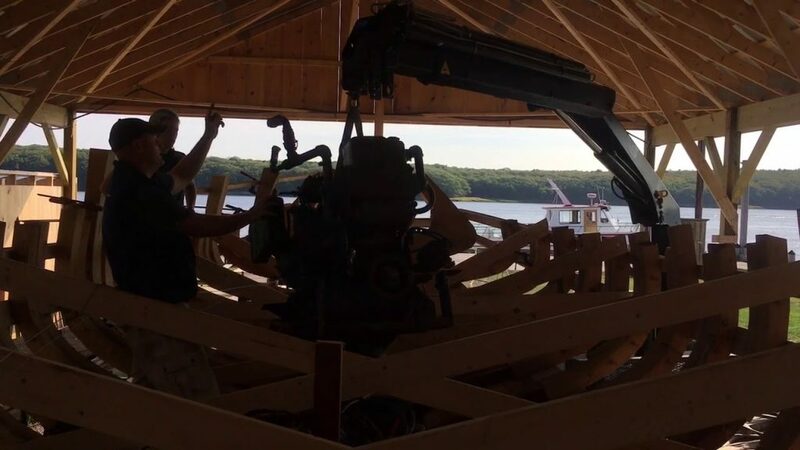 On May 9, Mary E was trucked from Robinhood Marina to the Preservation Pavillion, where she’ll spend the next six months being rehabilitated by shipwright Andros Kypragoras and his team. Visit the museum for an up-close look at the restoration process! Mary E Is Arriving… Again! Progress is being made on the Mary E Preservation Pavilion (generously sponsored by Highland Green)! Just in time, because tomorrow morning, Mary E will be hauled out in Georgetown, trucked to the museum, and unloaded at her home for the summer. 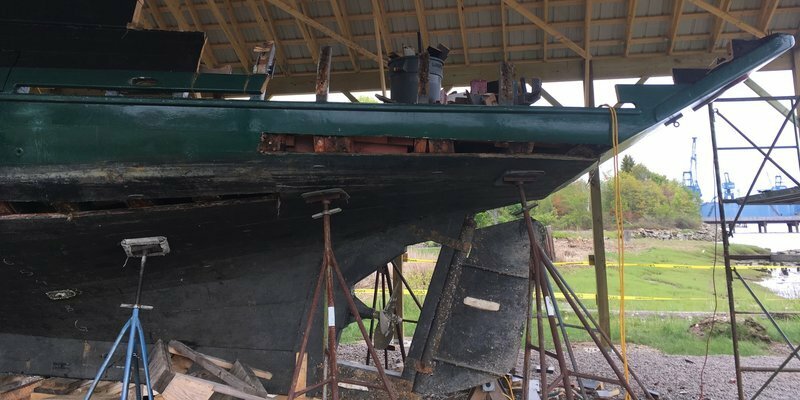 Starting next week (May 15) shipwright Andros Kypragoras and his crew will be on-site working on the restoration of Mary E, which you can see all summer long in the shipyard!If you’re in Bath tomorrow morning around 10 am, you may see Mary E cruising up Washington Street! Thanks to everyone who joined us to welcome Mary E home! Here’s some aerial footage from yesterday’s trip! 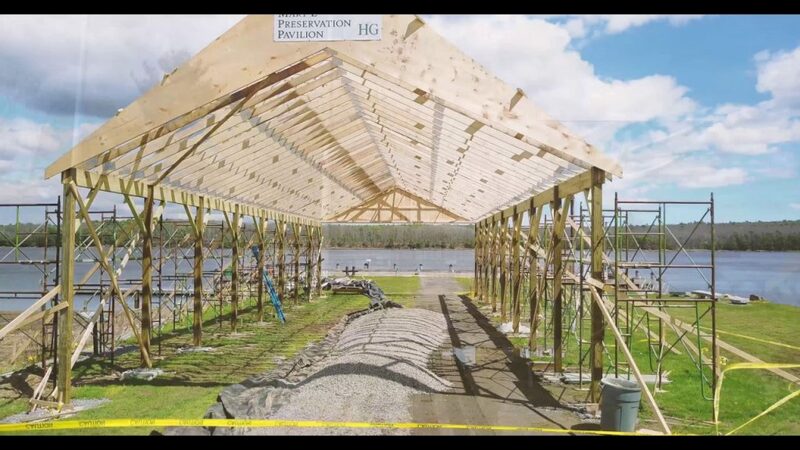 While Mary E rests patiently in Portland, work continues on the Highland Green preservation pavilion. 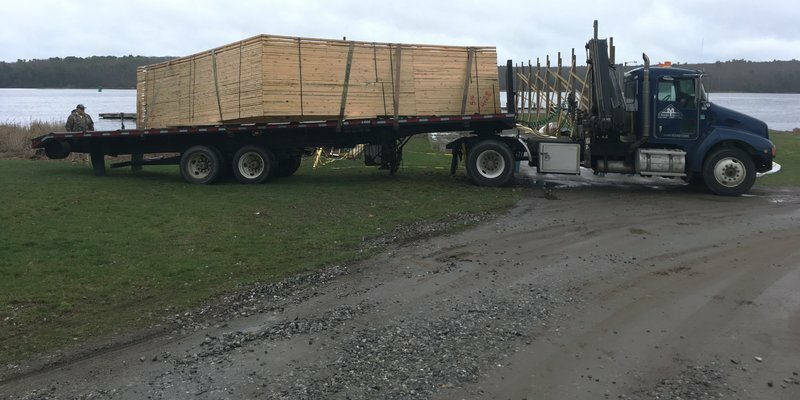 The trusses arrived this morning, all 41 of them. Next week we install the headers and braces, and the trusses soon after. We also will be down-rigging Mary E. Check back for exciting drone footage of these events, and don’t miss Mary E’s arrival this Sunday at 10am! We are now hiring for the 2017 summer season! There are lots of positions available, from boat crew to camp counselors, to guest services associates. Join the MMM team and spend your summer at the museum! Find details on all of our available positions here. Temperatures dropped overnight and we set off with a cool breeze and cloudy skies. We passed the Isles of Shoals and knew we were getting close to Maine. 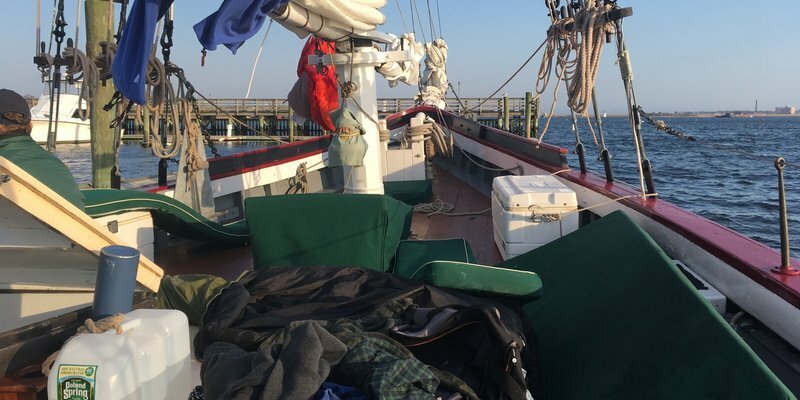 Seas were consistent and a crew member fell ill. I received a lesson on Mary E’s plumbing, and we were able to test the emergency bilge pump. We pulled in to Dimillo’s around 6:30pm, where we were greeted by two smiling employees who gave us access to showers, laundry, and wifi. By far the friendliest port of the trip. Plans were made to clean the vessel and prepare for her journey to Bath, which will begin Saturday morning at 10am. After rough seas the day before, Monday was fairly mellow. Breakfast was Easter eggs dyed the night before. We hit the Cape Cod Canal on the flood tide, and the gps was reading 11 knots. Residents waved as we passed, and we only encountered one tugboat along the entire canal. The waters of Cape Cod bay were also fairly calm, and we pulled in to Gloucester just as the sun was setting. The Captain and crew went to explore the town, and I prepared the meal. The temperature was dropping, so we turned in early, hoping to leave by 0600 the next morning. Today contained many weather elements: fog, sun, rain, wind, waves. The Captain’s log sums it up: Winds 20-25 knots, gusting to 30. Seas 5-7ft. Rough passage. The picture shows what 5-7 foot seas does to Mary E. A warm breeze in the evening helped dry out our bedding. The plan for tomorrow is to enter the Cape Cod Canal around 11am. Weather permitting, we will stay the night in Gloucester. Mary E officially began her journey home to the City of Ships this morning. Day 1 is complete: we are safe and sound in New London, Connecticut. We set off at sunrise and motored throughout the morning. By the afternoon we had a great 10-15 knot wind and were holding steady at 7.7 knots. The rain didn’t start until we passed by the lights of Electric Boat in the early evening, and by 7:30pm Mary E’s dock lines were made fast and she was ready to relax after a long day of work. 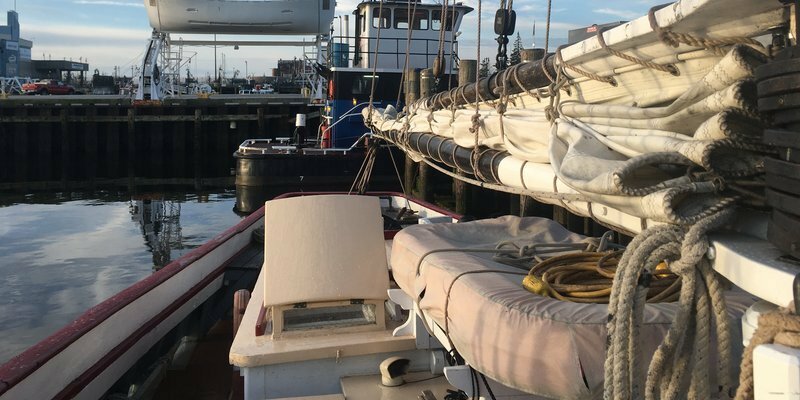 Tomorrow the goal is to reach New Bedford, and the forecast looks promising. As Mary E inches closer to arrival at MMM on April 23, we are continuing work on the Highland Green Preservation Pavilion. This structure will house Mary E while she undergoes a rehabilitation this summer. Posts are in, and the headers are fabricated and ready for installation. Trusses arrive next week. Not a bad place to work on these balmy spring days! 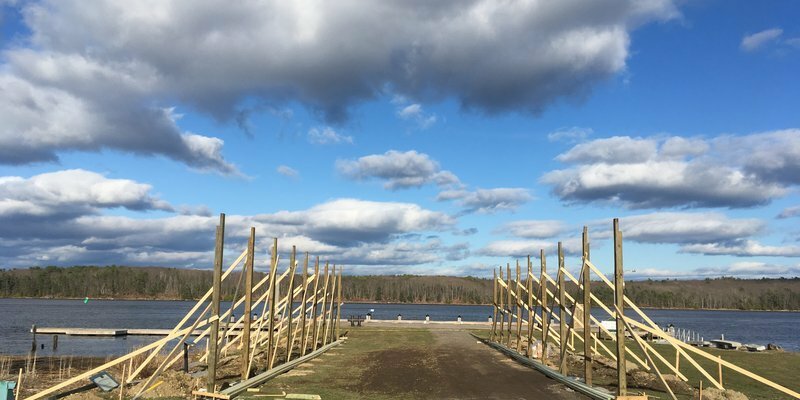 We are building a structure to keep Mary E (and the crew) protected from the elements during her restoration this summer. We’ve officially begun construction of the preservation pavilion and dug some holes in the ground. Which promptly filled with water. Next steps are setting concrete pads and putting up the posts. Stay tuned! Love the museum? Volunteer! 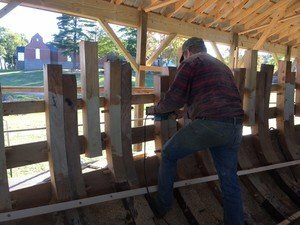 Posted Wednesday, March 1, 2017 by Katie MeyersinMaine Maritime Museum Did you know Maine Maritime Museum has a corps of over 250 volunteers who perform a wide range of jobs from greeting visitors, to maintaining the shipyard, to installing exhibits, to demonstrating how wooden sailing vessels were launched? To learn more about our awesome group of volunteers, join us at one of our recruitment parties! Tour Guide and Greeter Recruitment, Wednesday, April 5, 4-6 pm General Recruitment, Thursday, April 13, 4-6 pm. Contact Sarah Timm, Volunteer and Outreach Coordinator, at 443-1316 x350 or timm@maritimeme.org to learn more. Spring of 2017: Mary E is coming home! 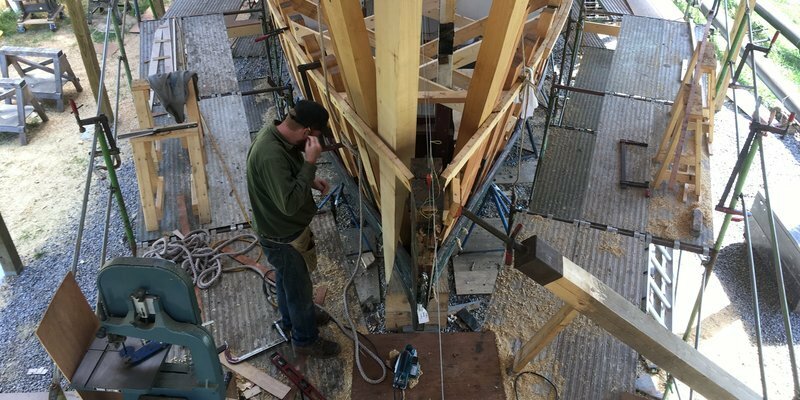 Posted Thursday, March 9, 2017 by Katie MeyersinMary E This spring, the historic schooner Mary E, believed to be the oldest Bath-built wooden schooner still afloat, is coming home to Maine Maritime Museum. 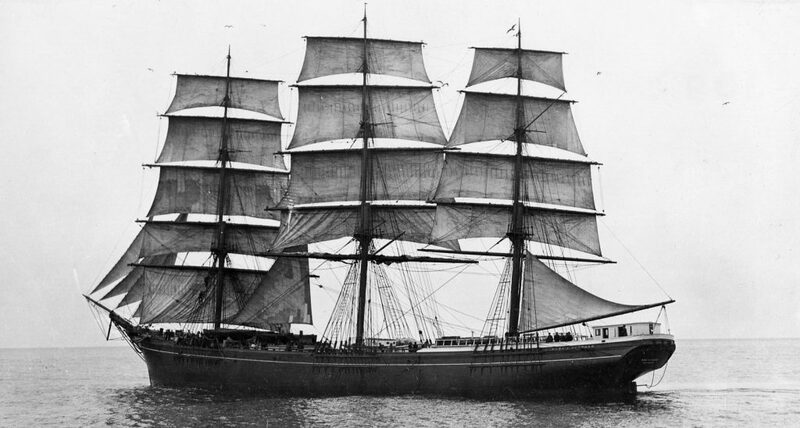 Built in Bath in 1906 by shipbuilder Thomas E. Hagan, and restored in Bath in 1965 by William R. Donnell II (on the grounds of what is now Maine Maritime Museum), Mary E is a two-masted clipper schooner with a sparred length of 73 feet. 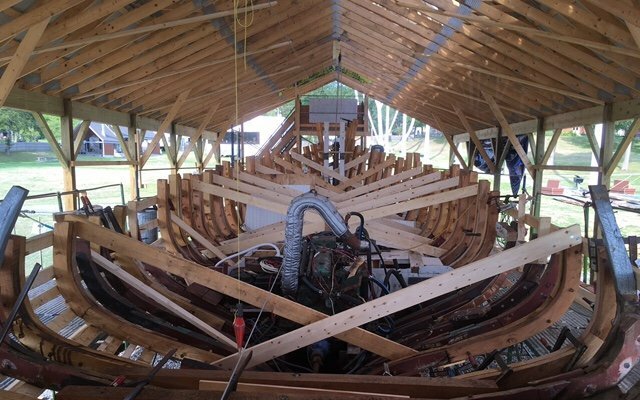 This is the last of 69 vessels built by Hagan and representative of the type of vessel that would have been seen all over the coast of Maine in the 1900s. 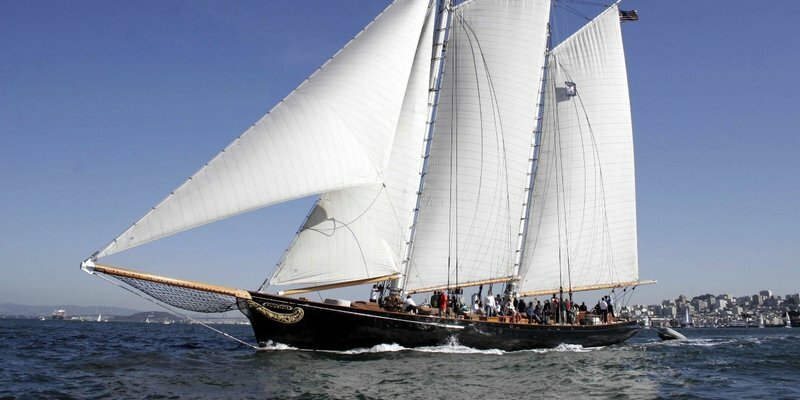 She is now the oldest wooden fishing schooner built in the state of Maine that is still sailing. Mary E will be arrive at the museum in spring 2017, and she will be restored on the museum’s campus this summer, giving visitors the opportunity to witness historic shipbuilding techniques first hand. Following completion of the work, Mary E will be docked at the museum, serving as a historic vessel accessible to everyone. 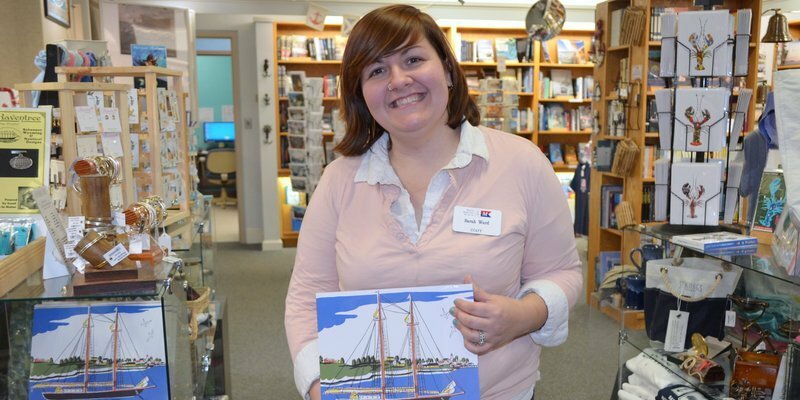 Mary E will also serve as the ambassador of Maine Maritime Museum and the City of Ships, traveling to events up and down the coast. MMM Is Bringing Mary E Home! Big news at the museum! Our board of trustees has approved the acquisition of the historic vessel Mary E, believed to be the oldest Bath-built wooden vessel still afloat. 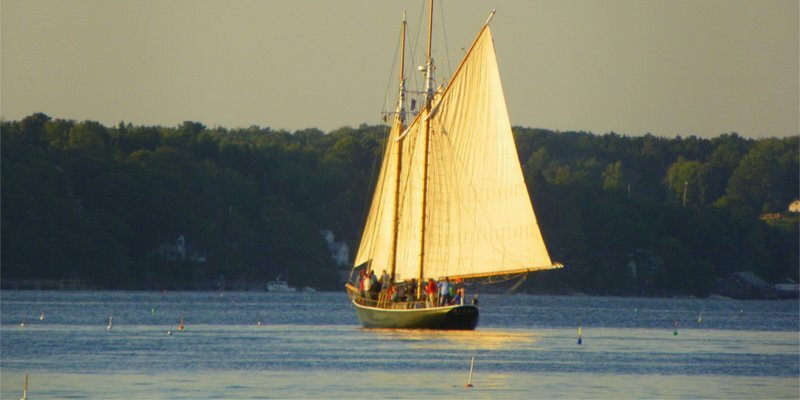 She is also the oldest fishing schooner built in the state of Maine that is still sailing. Built in Bath in 1906 by shipbuilder Thomas E. Hagan (in a Houghton shipyard where BIW is today), and restored in Bath in 1965 by William R. Donnell II (on the grounds of what is now Maine Maritime Museum), Mary E is a two-masted clipper schooner with a sparred length of 73 feet. 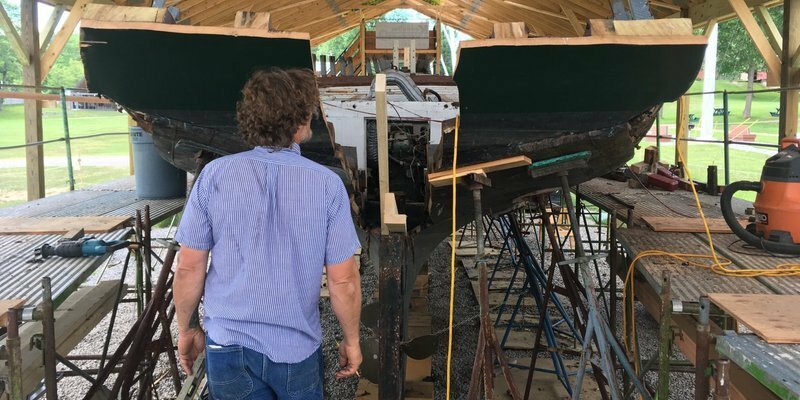 Mary E will be delivered to the museum in spring of 2017, and the restoration work started by her current owner, Matt Culen of Pelham, N.Y., will be completed on the museum’s campus, giving the public the opportunity to witness historic shipbuilding techniques first hand. Following completion of the work, Mary E will be docked at the museum, serving as a historic vessel accessible to everyone. Mary E will also serve as the ambassador of Maine Maritime Museum and the City of Ships, traveling to events up and down the coast. Learn more! 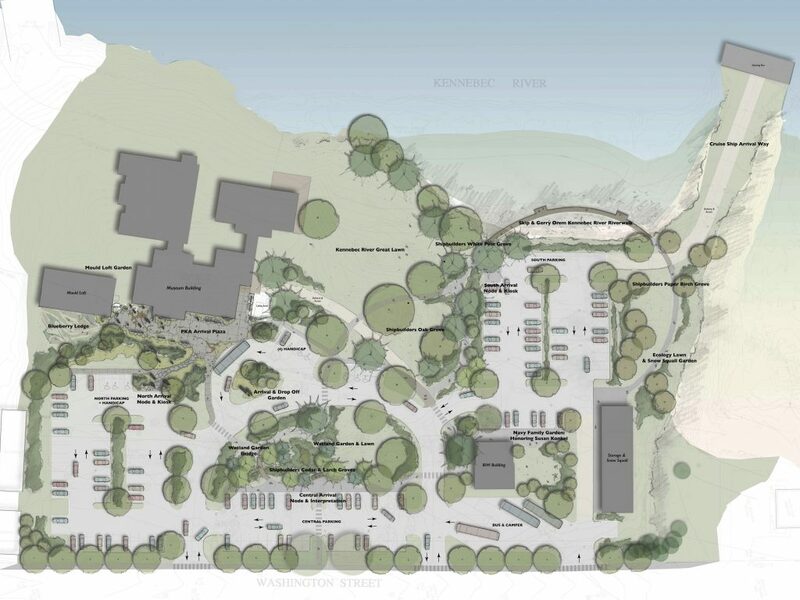 Posted Monday, December 12, 2016 by Katie MeyersinMaine Maritime Museum On December 12, 2016, the museum broke ground on construction of a new 600-square-foot gallery space that will house an immersive lighthouse exhibit, Into the Lantern: A Lighthouse Experience. Opening in summer 2017, the exhibit will house the second-order Fresnel lens that that once guided ships into Portland, Maine, from the east Cape Elizabeth Lighthouse tower (formerly known as Two Lights). The lens in the exhibit is the original ca. 1874 Fresnel lens that was in the east lantern until 1991. Into the Lantern: A Lighthouse Experience will be the first exhibit of its kind to include a 180-degree media projection system with time-lapse videography of the active panorama of the Gulf of Maine, simulating the experience of standing in the lantern (the room at the top of a lighthouse tower where the lens is located) by showcasing changing views of Casco Bay as seen from the tower. Into the Lantern is anticipated to open in June 2017. 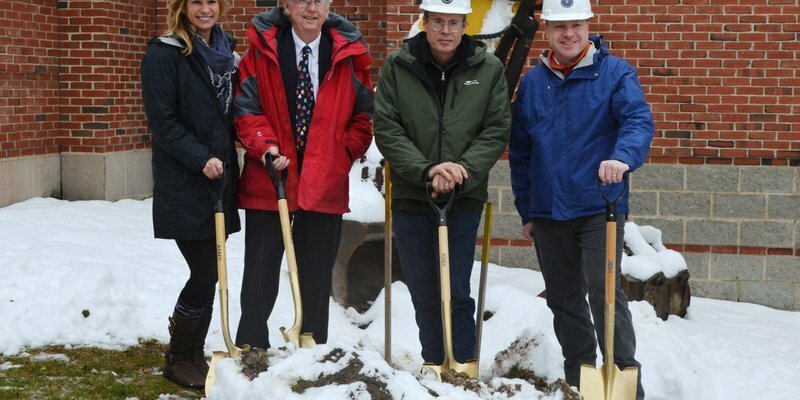 Caption: Preparing to break ground on construction of the new gallery are Patty Grennon, Cape Elizabeth Town Council; Steve Caulfield, chairman of the museum’s board of trustees; Chris Hall, the museum’s curator of exhibits; and Jamie Garvin, Cape Elizabeth Town Council. Magical Evenings with Santa: December 8, 15, and 22! Posted Monday, December 5, 2016 by Katie MeyersinMaine Maritime Museum Thursdays in December (December 8, 15, and 22) we will be keeping the doors to the museum open late for Magical Evenings with Santa! From 5 to 7:30 pm, visit the museum for only $5 adults/ $3 ages 6-12. Visit with Santa, explore Captain Christmas’ Magical Boatshop, and enjoy an extra 10% off in the museum store (that’s 20% off for members!) The museum store has tons of great holiday gifts, including toys, books, staff favorites from Stonewall Kitchen and Sea Bags, and guest services associate Sarah Ward’s pick: the 2017 Dahlov Ipcar calendar! Remember, admission is not required to shop the museum store! 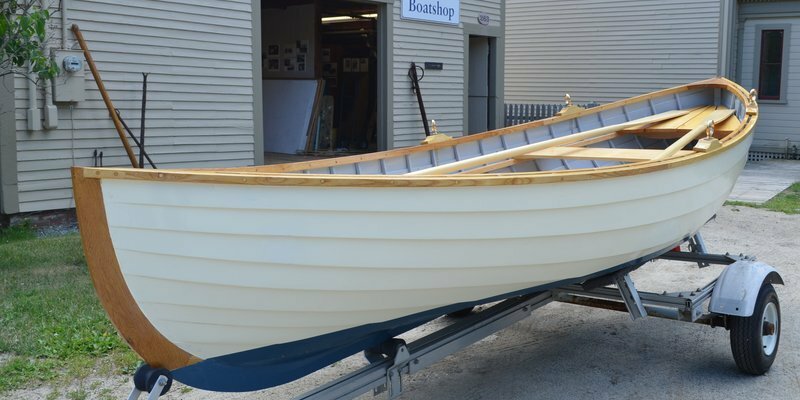 Posted Wednesday, October 26, 2016 by Katie MeyersinMaine Maritime Museum, Boatshop, wooden boat Built in Massachusetts in 1994, this 12-foot Whitehall-style pulling boat was lovingly restored in the Boatshop and is now ready for a new home! For details contact Kurt Spiridakis, Director of Watercraft and Traditional Skills, at 207-443-1316 x 334. This boat was generously dontaed to the museum by Ken Crocker. 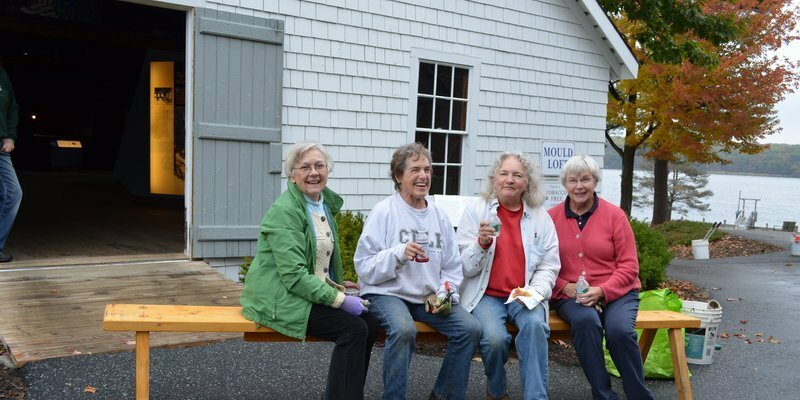 Posted Monday, September 26, 2016 by Katie MeyersinMaine Maritime Museum This fall, Maine Maritime Museum is excited to partner with Farnsworth Art Museum, Boothbay Railway Village and Damariscotta Pumpkinfest & Regatta to introduce Maine’s Pumpkin Trail, a collaboration that includes family-friendly activities along a 50-mile stretch of Maine’s coast from Bath to Rockland running through the end of October. 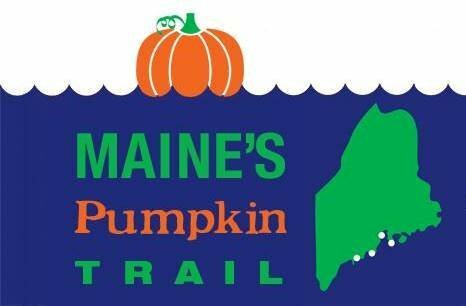 Learn more about all of the awesome fall events in the Midcoast by following Maine’s Pumpkin Trail on Facebook! 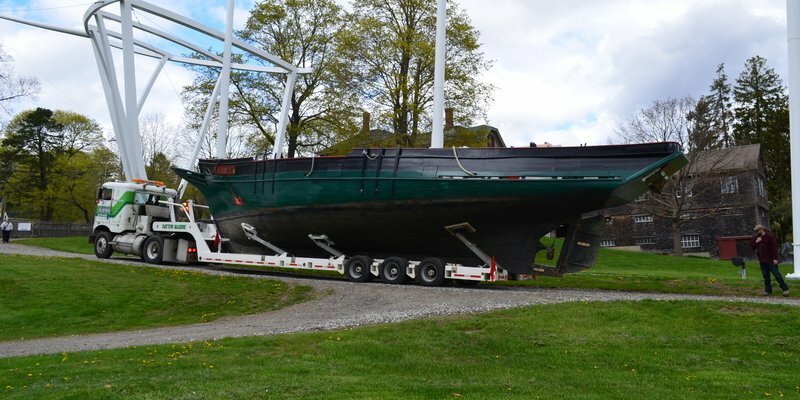 Posted Thursday, July 21, 2016 by Katie MeyersinMaine Maritime Museum August 1 & 2, the museum is excited to host America, a replica of the vessel that started the America’s Cup tradition in 1851, when she makes a port visit to Maine Maritime Museum as part of her North American voyage as the official ambassador of The America’s Cup. Visitors can tour this magnificent 139-foot vessel August 1 & 2 from 10 am to 3 pm. Ticketing information can be found here. Looking for a more in-depth America experience? 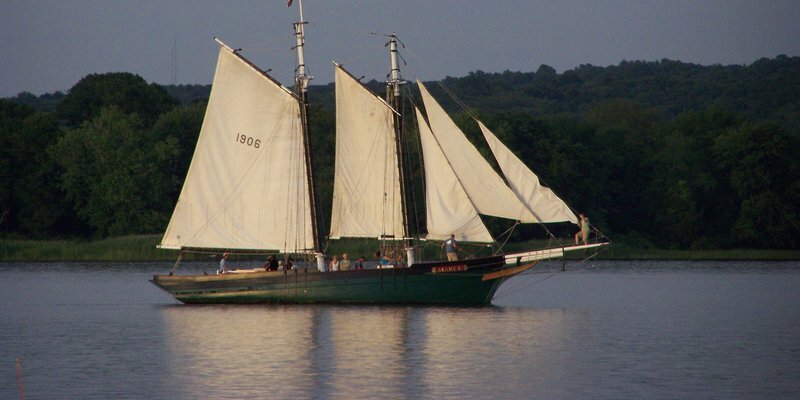 Next Level Sailing is offering evening sails on America down the Kennebec on August 1 & 2. Details are available here. We will also be offering a lecture on August 1 to coincide with America‘s visit: The History and Evolution of the America’s Cup. Troy Sears, owner and captain of the schoonerAmerica, will lead a conversation about the America’s Cup and engage existing fans about the past, present and future direction of this 166-year old sporting event. More information on the lecture can be found here. 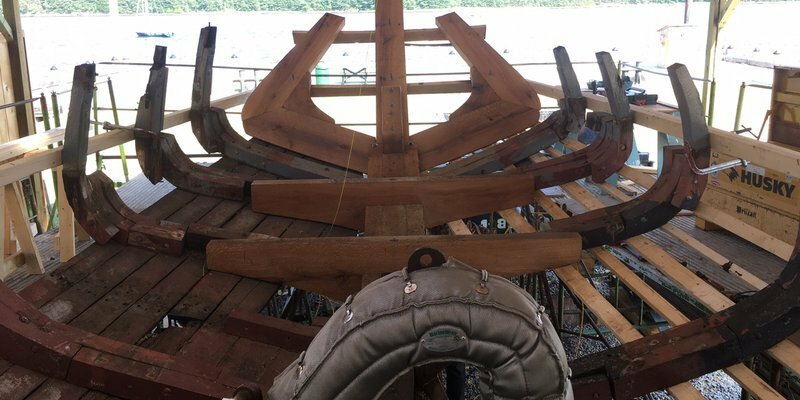 Posted Wednesday, August 3, 2016 by Katie MeyersinMaine Maritime Museum, Boatshop, wooden boat For sale: a beautiful 15-foot John Gardner Peapod built in the Boatshop! 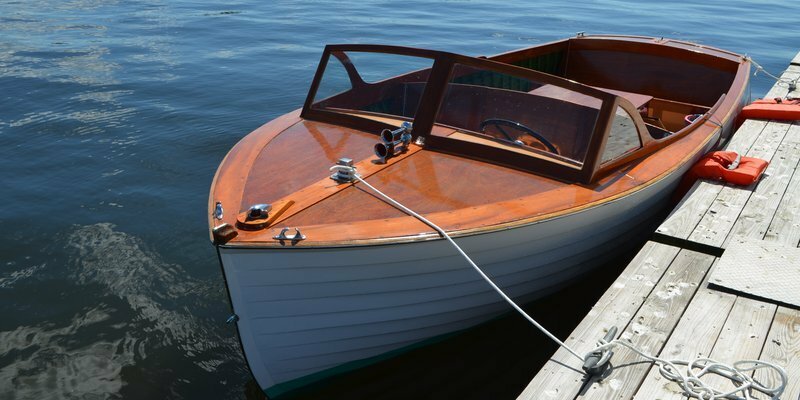 This boat is built of Maine cedar planking on oak frames, has a 58-inch beam, and includes two 9-foot spruce oars. 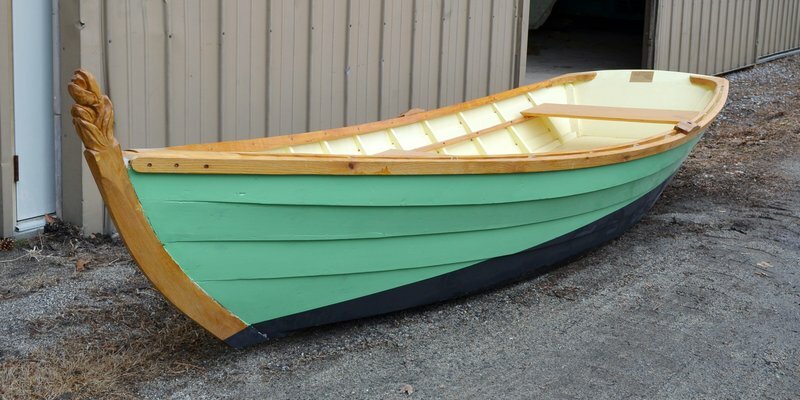 Price is $8,000, for details, contact Boatshop Manager Kurt Spiridakis at boatshop@maritimeme.org or 207-443-1316 x 334. 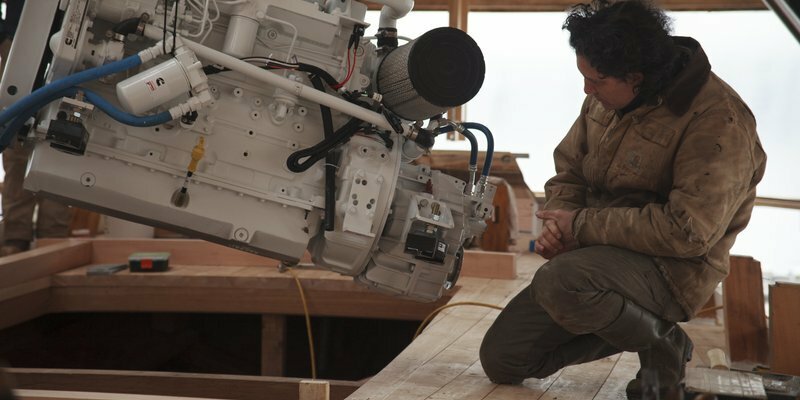 Celebrating 20 Years of Discovery Boatbuilding! Summer Camp on the Kennebec! Posted Monday, April 11, 2016 by Katie MeyersinMaine Maritime Museum, summer camp Making plans for the summer? 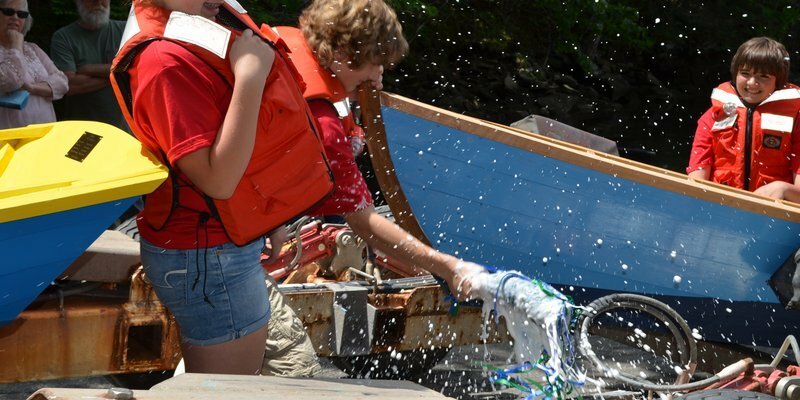 Send your son or daughter to one of four sessions of our Kennebec Explorers Day Camp, collaboratively led by Maine Maritime Museum and the Kennebec Estuary Land Trust. 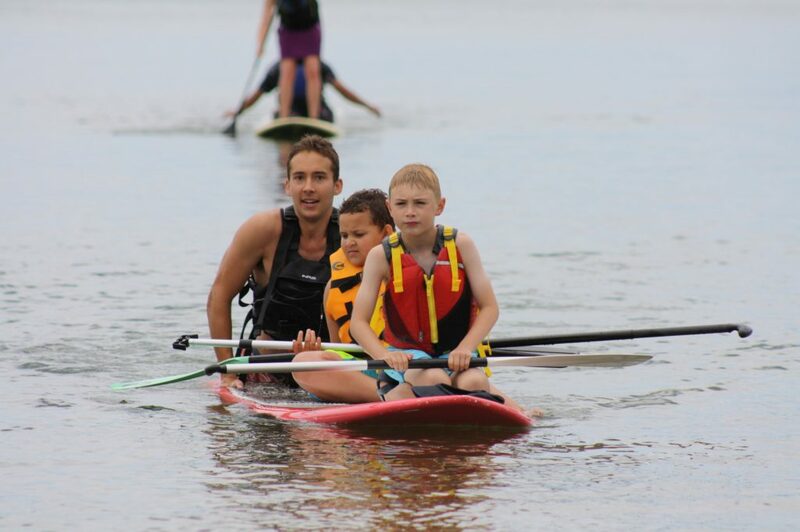 Campers enjoy boat cruises, kayaking expeditions, arts & crafts, and so much more! The five-day sessions run June 20-24, July 18-22, August 1-5, and August 15-19. Learn more about Kennebec Explorers Camp here. 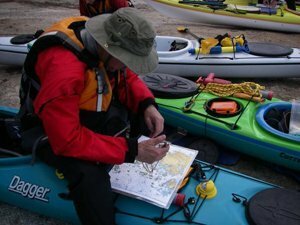 Posted Tuesday, January 5, 2016 by Katie MeyersinMaine Maritime Museum Registration is now open for our 2016 sailing, safety, and navigation classes! Don’t miss out on these popular courses, reserve your spot today. All of the details are available here. 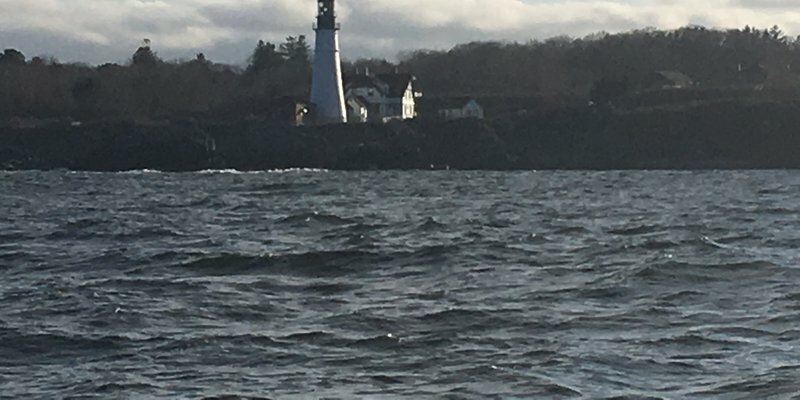 Posted Thursday, January 14, 2016 by Katie MeyersinMaine Maritime Museum, Lobster exhibit Are you one of the thousands of people who have experienced Lobstering & the Maine Coast since it’s opening last summer? The exhibit offers an inside look at one of Maine’s most important, complex, and ever-changing industries. If you’d like to receive the regular updates on the state of Maine’s lobster industry and support research and education to help sustain Maine’s most iconic fishery, support our friends at the Maine Lobstermen’s Community Alliance. Donations of $25 or more include a subscription to Landings, the monthly newsletter of the Maine Lobstermen’s Association. 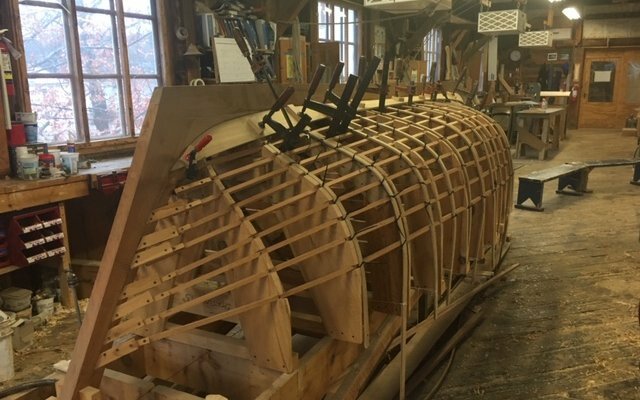 Posted Wednesday, December 9, 2015 by Katie MeyersinMaine Maritime Museum, Boatshop, boat building, wooden boat Who wouldn’t like to find this beautiful boat under their tree?! 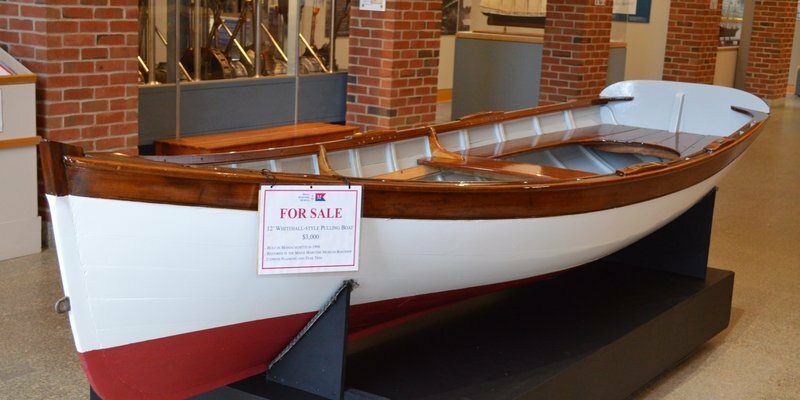 This 14-foot Whitehall-style pulling boat, built in the Maine Maritime Museum Boatshop, is constructed from Atlantic cedar planking on oak frames with pine thwarts and 56″ beam, and could be yours by Christmas for $5,995. For details, contact Boatshop Manager Kurt Spiridakis at boatshop@maritimeme.org or 207-443-1316 x334. Posted Tuesday, December 1, 2015 by Katie MeyersinMaine Maritime Museum December 1 is #GivingTuesday, a day to inspire generosity, celebrate the spirit of the holiday season, and give thanks to all of the donors who generously support Maine Maritime Museum. To celebrate, we asked some of our donors, “Why do you give?” To give a year-end gift in honor of #GivingTuesday, click here. Thank you, and happy holidays! Join Our Volunteer Team! 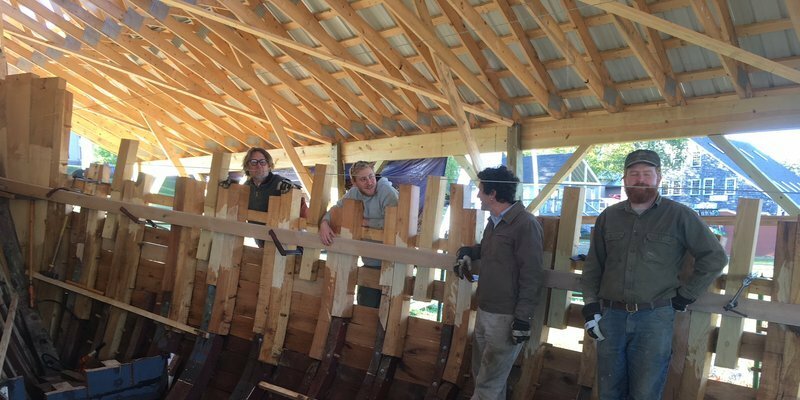 Did you know Maine Maritime Museum has a corps of over 250 volunteers who perform a wide range of jobs from greeting visitors, to maintaining the shipyard, to installing exhibits, to demonstrating how wooden sailing vessels were launched? If you would like to learn more about our awesome group of volunteers, join us at one of our recruitment parties! 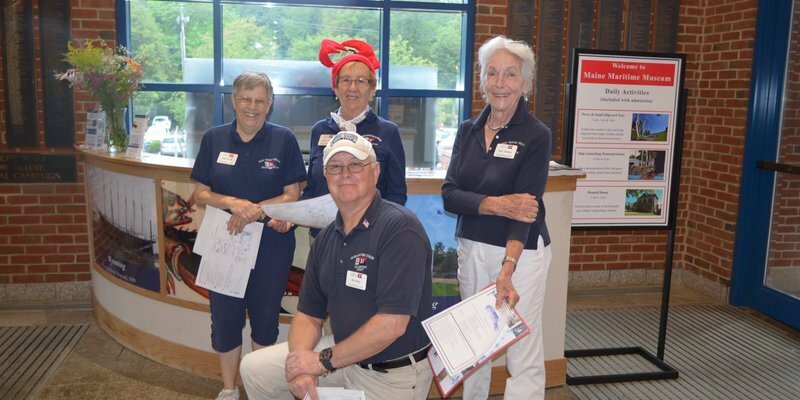 Tour Guide Recruitment Party: Friday, April 1, 4-6 pm General Volunteer Recruitment Party, Wednesday, April 6, 4-6 pm Learn more about all of our volunteer opportunities here, or contact our Volunteer Coordinator Katy Taylor at 207-443-1316 x350 or volunteer@maritimeme.org. 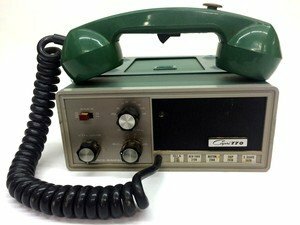 Posted Monday, October 26, 2015 by Katie MeyersinMaine Maritime Museum Opening November 14, Wavelength: The Story at Signals at Sea, will explore the history of maritime communications. Signal flag interactives, an engine room telegraph, and demonstrations of actual Morse code transmissions will make Wavelength a can’t-miss experience. Get all the details here! 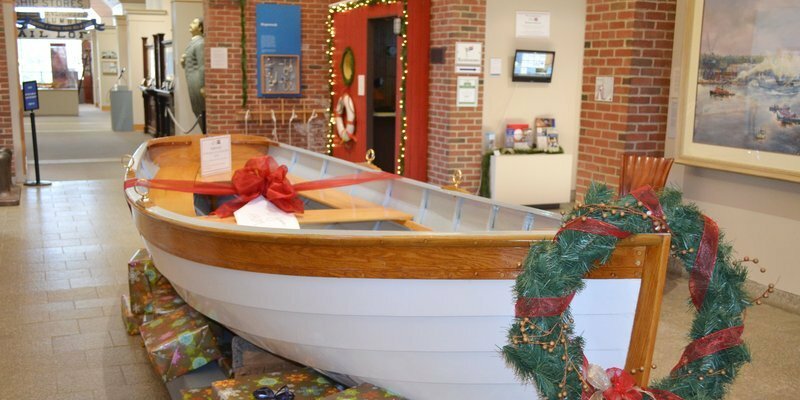 Celebrate the Season at Maine Maritime Museum! 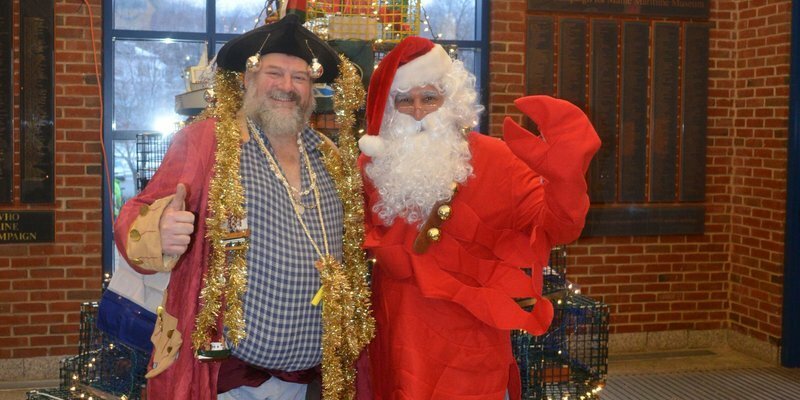 Posted Monday, November 16, 2015 by Katie MeyersinMaine Maritime Museum Kick off the holiday season with a full day of festive fun at the museum on Saturday, December 5! From 1-4 pm, we’ll be hosting our second annual free family day at the museum, which will include face painting, ornament decorating, and appearances by Captain Christmas and Santa Claws! Then, from 4:30-6:30 pm, leave the kiddos at home and join us in Long Reach Hall for The Spirit of Maine: Holiday Rum Tasting, a history of distilling in the Pine Tree State and a guided tasting of Maine-made rums. 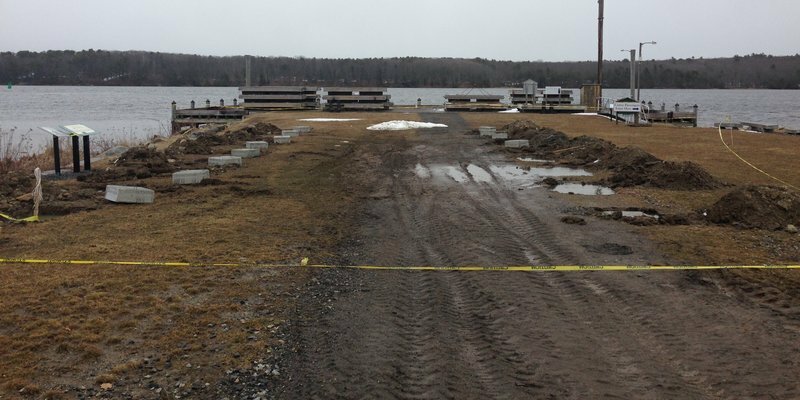 At 6:30, everyone is invited to gather in the Percy & Small Shipyard to view the first ever lighting of New England’s largest sculpture: Wyoming. Learn more about all of our upcoming events here. 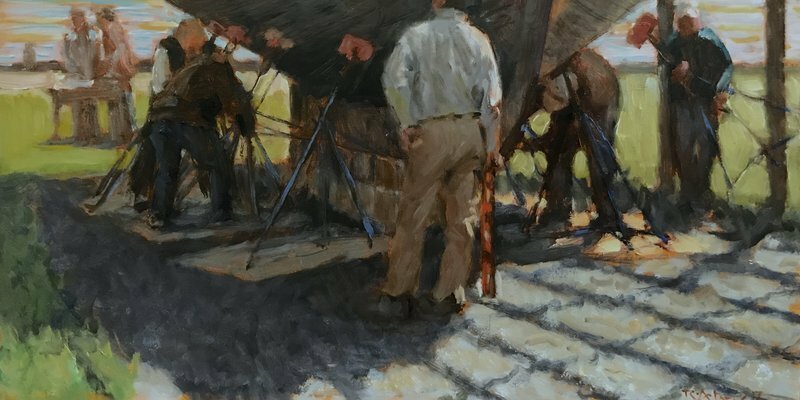 Posted Tuesday, September 29, 2015 by Katie MeyersinMaine Maritime Museum, exhibit In Sight: Prints by John Wissemann of BIW and Bath’s Working Waterfront will open in the Marjorie W. Kramer Gallery on October 24, 2015. 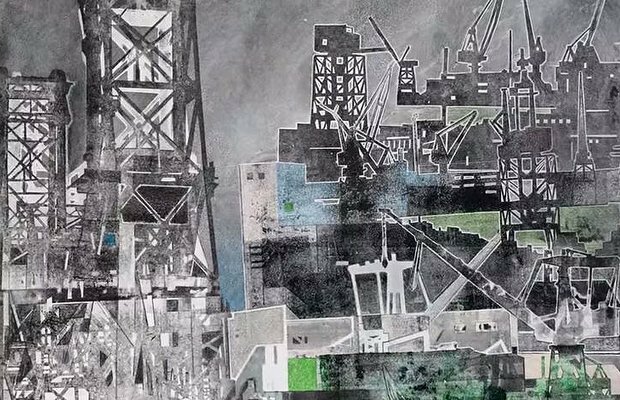 “The Bath Iron Works Series,” an outgrowth of a previous series called “The Working Waterfront,” includes colored pencil on multilayer mono-prints of the BIW shipyard and related waterfront. Learn more about this unique exhibit here. National Lobster Day is September 25, Party With the Lobstermobile! Posted Thursday, September 24, 2015 by Katie MeyersinMaine Maritime Museum, Lobster exhibit Friday, September 25 is National Lobster Day and we are going to celebrate! Follow the Lobstermobile on a “Maine Adventure,” then meet us at the museum at 3 pm to party with the Lobstermobile and explore Lobstering & the Maine Coast, the state’s largest and most comprehensive exhibit on lobstering! Get all the details here. 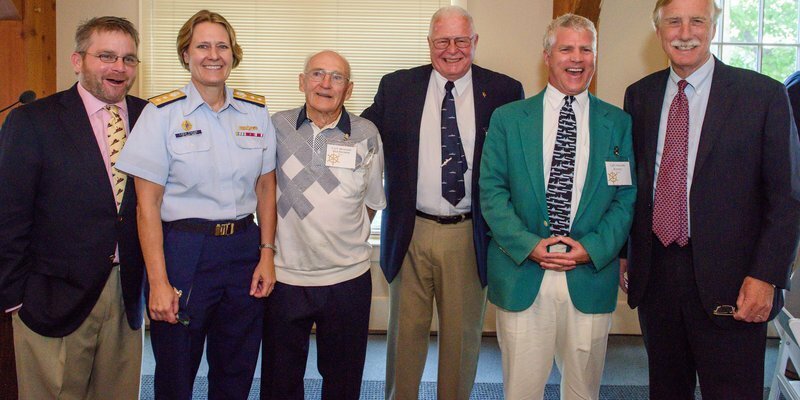 Posted Friday, August 28, 2015 by Katie MeyersinMaine Maritime Museum, Mariners Award Maine Maritime Museum was pleased to honor Maine’s marine pilots and the two commissions that oversee them, the Maine Pilotage Commission and the Port of Portland Board of Harbor Commissioners, with the 2015 Mariners Award at a ceremony held at the museum August 26. The Mariners Award is presented annually to an individual or organization that has made extraordinary contributions to Maine’s maritime heritage and significantly impacted the state’s culture and economy. Learn more here. 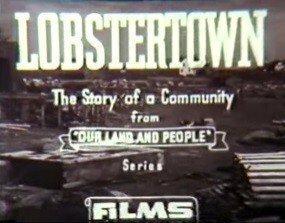 Posted Thursday, August 6, 2015 by Katie MeyersinMaine Maritime Museum To coincide with the opening of Lobstering & the Maine Coast, we are offering a lecture and film series for visitors looking to further explore some of the themes included in the exhibit. We are excited to welcome a range of lobster industry experts to share their expertise on topics ranging from biology to processing, science to sustainability. Learn more about all of our upcoming lectures and films here. 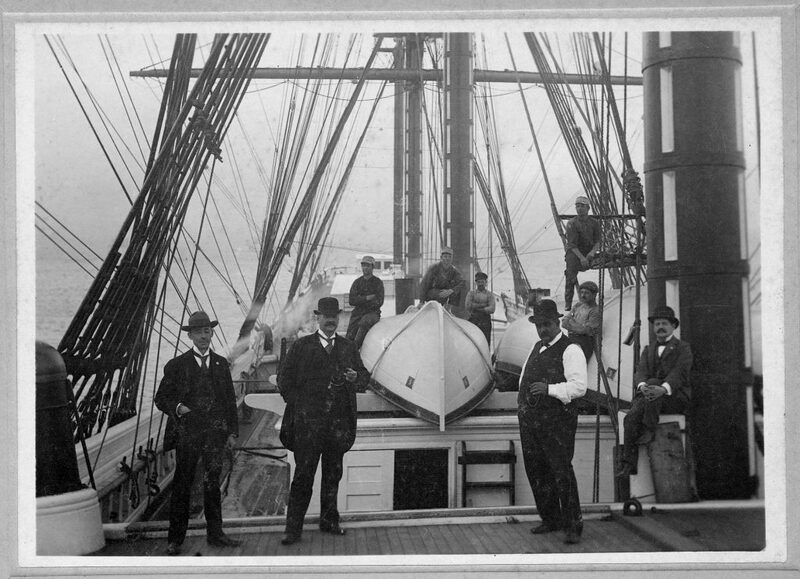 Posted Monday, June 15, 2015 by Katie MeyersinMaine Maritime Museum Learn the stories of the prominent shipbuilders who helped build Bath on our trolley tour of the city – Historic Bath: The City That Ships Built. 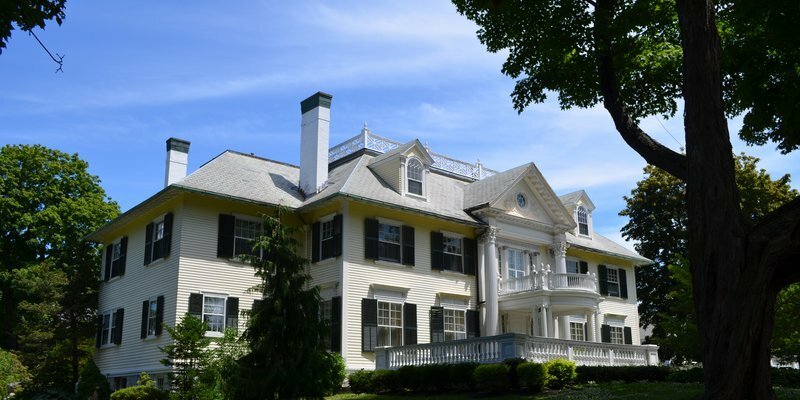 Our guide will share the history behind some of Bath’s most recognizable homes, and the families who resided in them. Tours start June 16 and run Tuesdays, Thursday and Sundays at noon. Get all the details here. 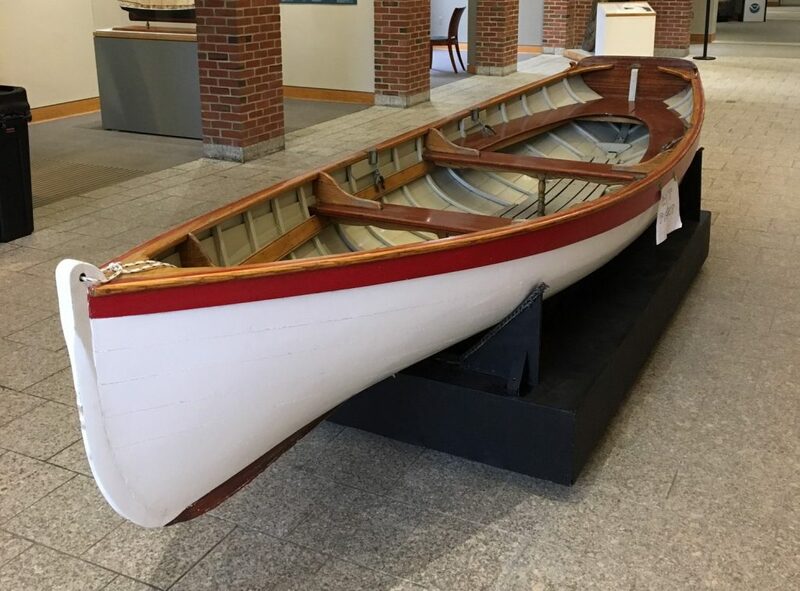 Posted Thursday, May 28, 2015 by Katie MeyersinMaine Maritime Museum, Boatshop, wooden boat Tickets are now on sale for a chance to win our 2015 raffle boat: this beautiful 15-foot Whitehall pulling boat! Get all the details (and your tickets) here. Raising the Flags to Welcome Summer! 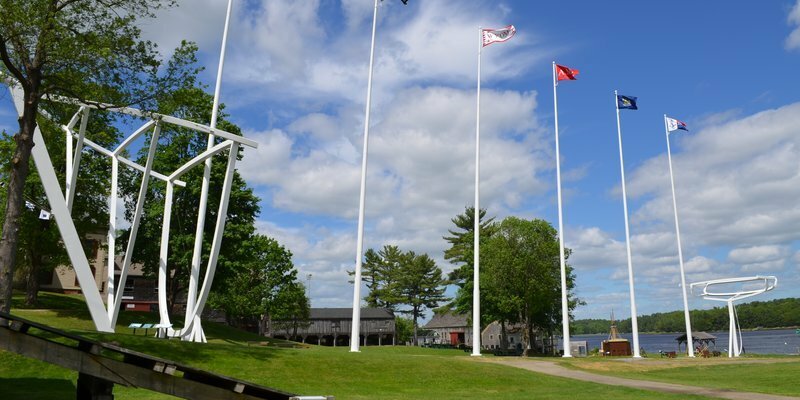 Posted Tuesday, May 26, 2015 by Katie MeyersinMaine Maritime Museum The museum recently celebrated the unofficial start to the busy summer season with an annual tradition: raising the flags on the Wyoming masts! It takes a few minutes for the 20-foot flags to make the 120-foot journey up the masts, so enjoy this high-speed look at the process. 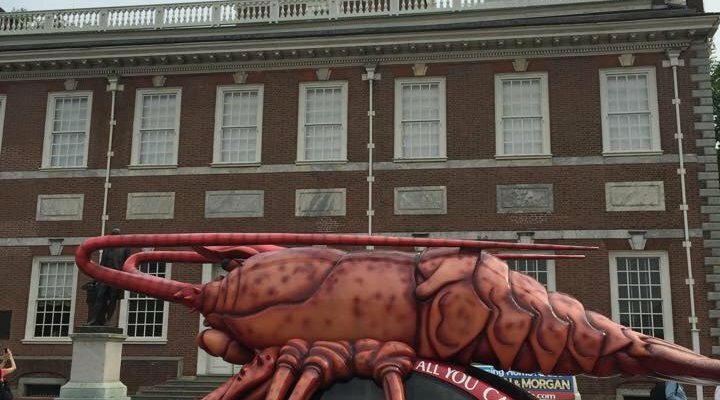 Lobstermobile Arriving at Museum May 19! Posted Monday, May 18, 2015 by Katie MeyersinMaine Maritime Museum, Lobster exhibit The Lobstermobile, which has been making its way up the East Coast since last week, is scheduled to arrive at the museum Tuesday, May 19, around 11 am, and we’ll be hosting a welcome home/retirement party to celebrate its arrival. 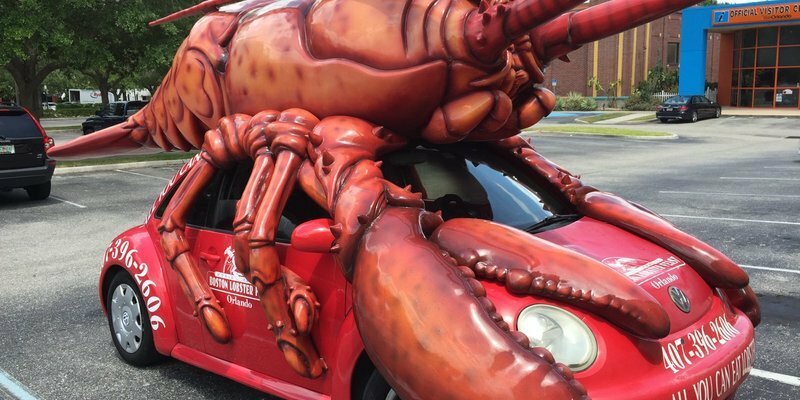 Please join us to welcome the Lobstermobile to Maine! 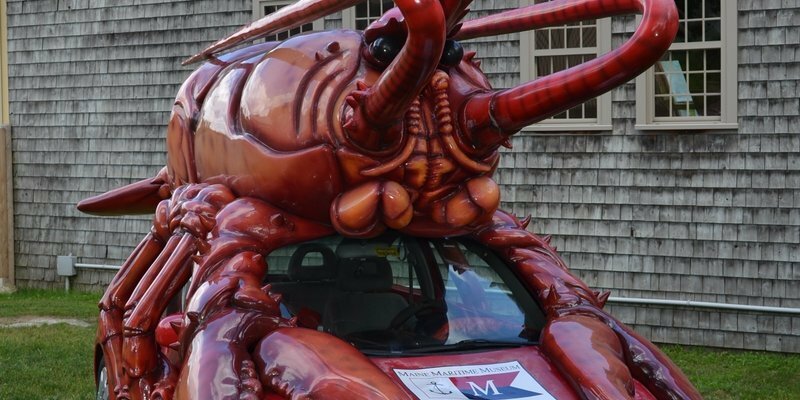 The Lobstermobile was generously donated to the museum by Orlando, Fla., restaurant Boston Lobster Feast and will be on-hand to help us celebrate the grand opening of Lobstering & the Maine Coast on Sunday, July 26! Posted Friday, May 15, 2015 by Katie MeyersinMaine Maritime Museum Thanks to a generous donation from Orlando, Fla., restaurant Boston Lobster Feast, the museum will soon be welcoming the Lobstermobile to help us celebrate the opening of Lobstering & the Maine Coast on July 29! After 15 years of service in Florida, the Lobstermobile will be retiring to Maine and is scheduled to arrive at the museum in the afternoon on Tuesday, May 19. Follow us on Facebook and Twitter to track its journey up the East Coast! It’s Almost Summer Camp Season! 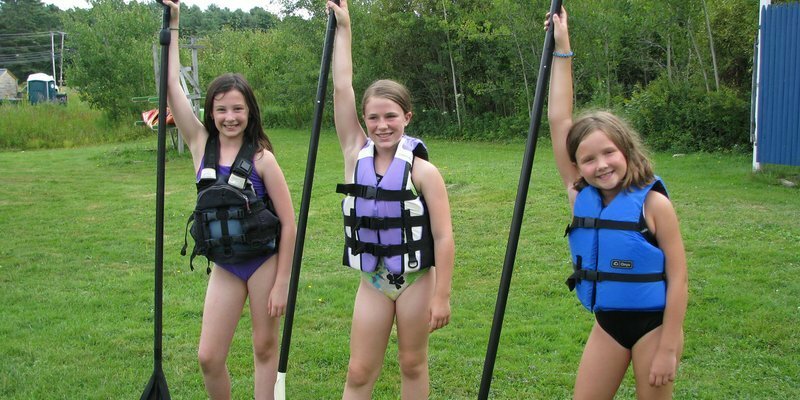 Posted Wednesday, May 6, 2015 by Katie MeyersinMaine Maritime Museum Is your 7 to 11-year-old looking for some fun, outdoor adventures this summer! Register now for our Kennebec Explorers Day Camp! 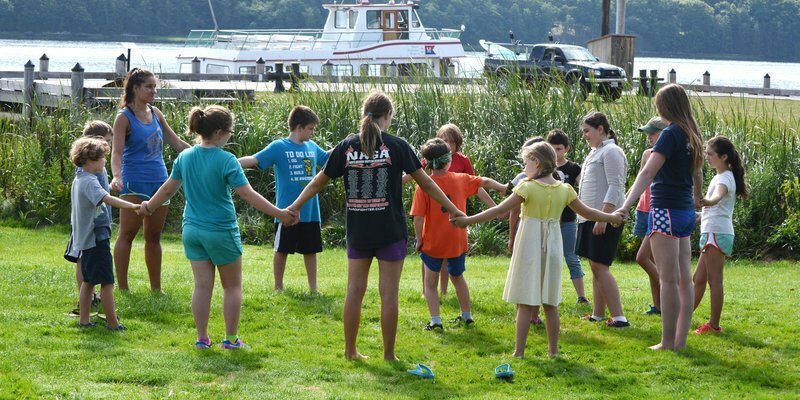 We offer four five-day sessions of camp, which is collaboratively lead by Maine Maritime Museum & Kennebec Estuary Land Trust. 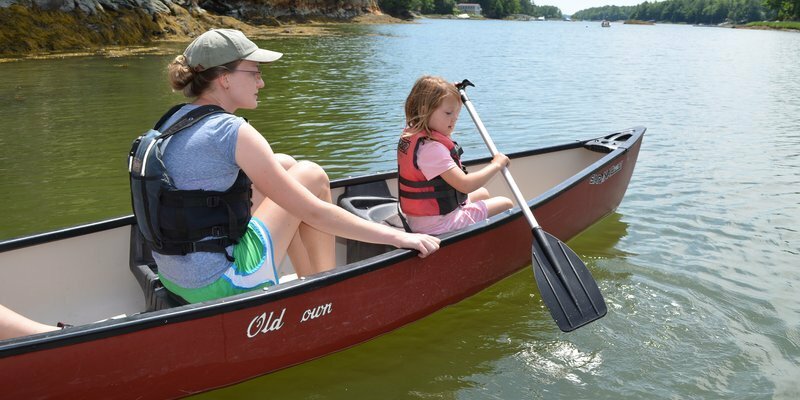 Your child will explore Merrymeeting Bay by kayak, tour the Kennbec on a boat cruise, learn about the maritime history of Maine through hands-on activities, and have so much fun! Space is very limited, and advance registration is required. Get all the details here! The 2015 BIW Story Trolley Tour Schedule Is Here! Posted Thursday, April 30, 2015 by Katie MeyersinMaine Maritime Museum, Bath Iron Works Back for 2015: our popular Bath Iron Works Story Trolley Tour! Hear about the history of this famous shipyard and learn how the most advanced ships in the world are constructed. 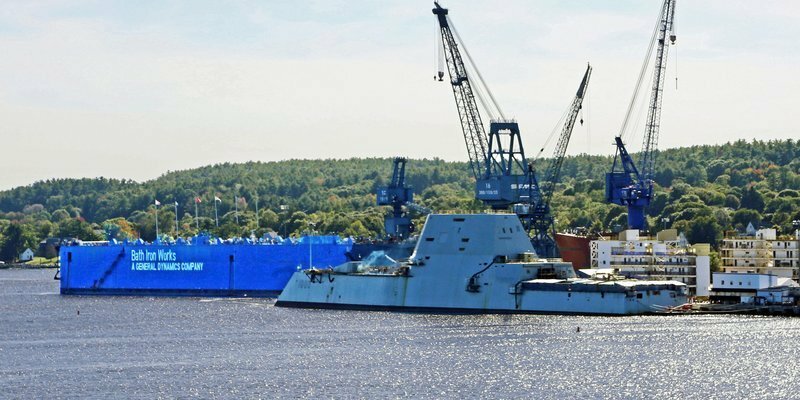 From the 1937 America’s Cup defender Ranger to the Zumwalt-class guided missile destroyer DDG 1000, BIW has always been a leader in building the most advanced ships afloat. Your tour begins with an introductory video that takes you behind the scenes to detail the building process and features the employees who take great pride in constructing the Navy’s most advanced warships. You will then board the trolley for a rolling tour through Bath, past the BIW yard where your guide will fill you in on some of the most interesting tidbits of history that occured in the yard and explain just what it is you are viewing, highlighting key elements that can be seen in the shipyard. Make your reservations now, this tour is often a sell-out! Don’t Miss the Bath Iron Works Story Trolley Tour! 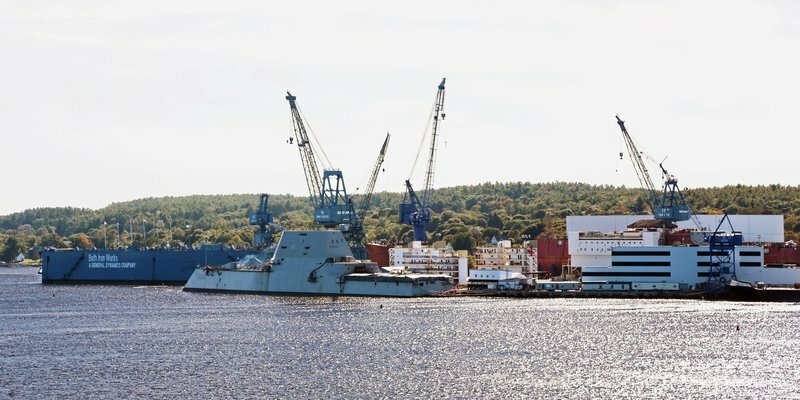 Posted Wednesday, May 20, 2015 by Katie MeyersinMaine Maritime Museum, Bath Iron Works Learn the inside story of BIW, reserve your seat on our Bath Iron Works Story trolley tour! Tours are running Mondays, Wednesdays and Fridays at 12 pm and Saturdays at 10 am. Get all the details here. These guys work fast! 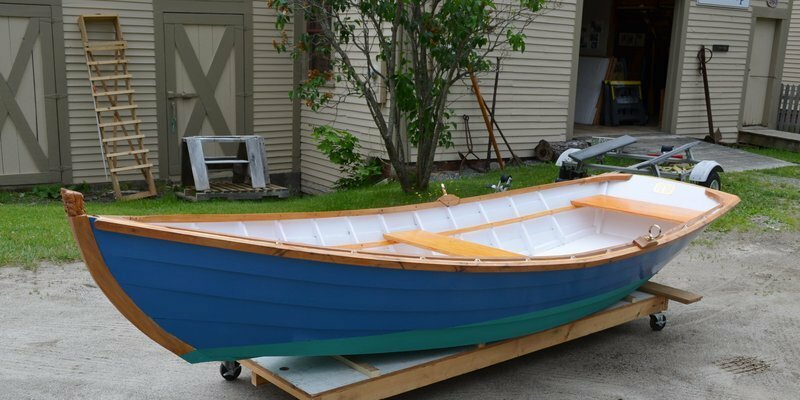 Kurt Spiridakis, Boatshop manager, says, “Getting into all the nooks and crannies to paint a lapstrake boat can be tricky with just a paintbrush, so we decided to employ the services of a volunteer’s spray gun. Because the boatshop is now so well insulated and airtight, we needed to use an outside air supply for breathing. 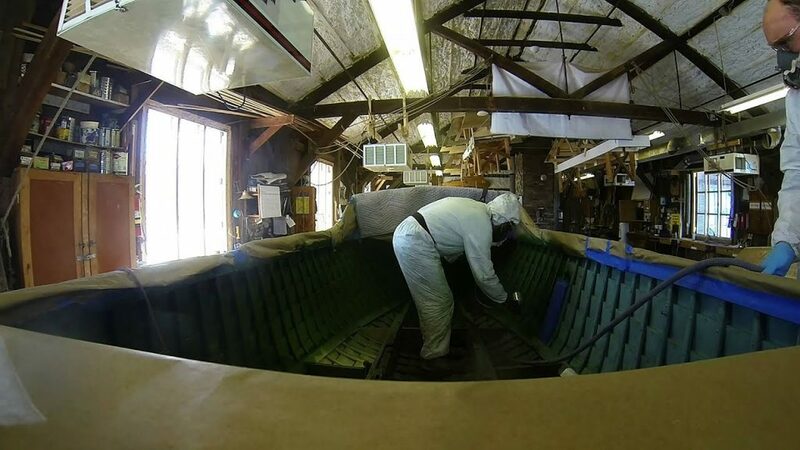 Luckily we decided to paint a similar color as the original, so the paint went on nicely with two thin coats.” Follow what’s going on in the Boatshop here. 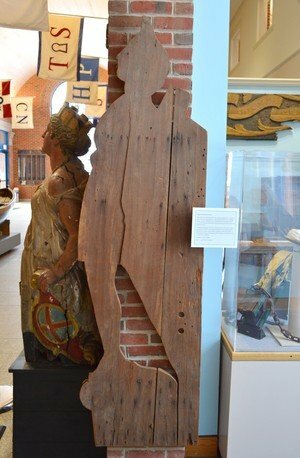 Vote for Maine Maritime Museum! 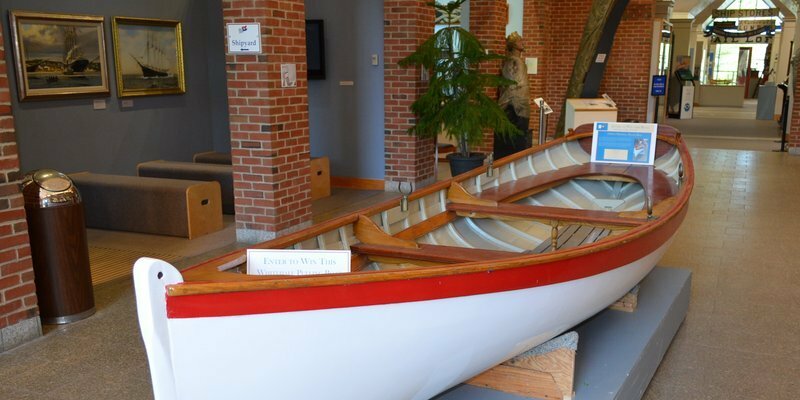 Posted Thursday, March 5, 2015 by Katie MeyersinMaine Maritime Museum Vote for MMM and our Discovery Boatbuilding Program could win a donation of up to $10,000! 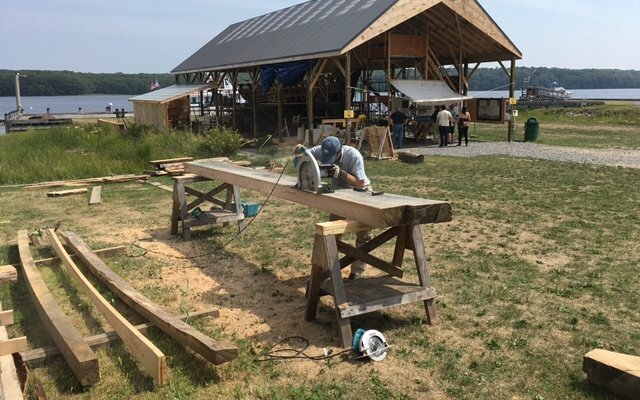 PC Construction in Portland has chosen the Discovery Boatbuilding Program to be one of 10 nonprofits in their contest, “Building Communities: PC Construction Gives Back.” The top three winners, determined by number of votes, will receive donations totalling $15,000! Please vote here! Check Out Ingrained: The Art of the Shipcarver this weekend! 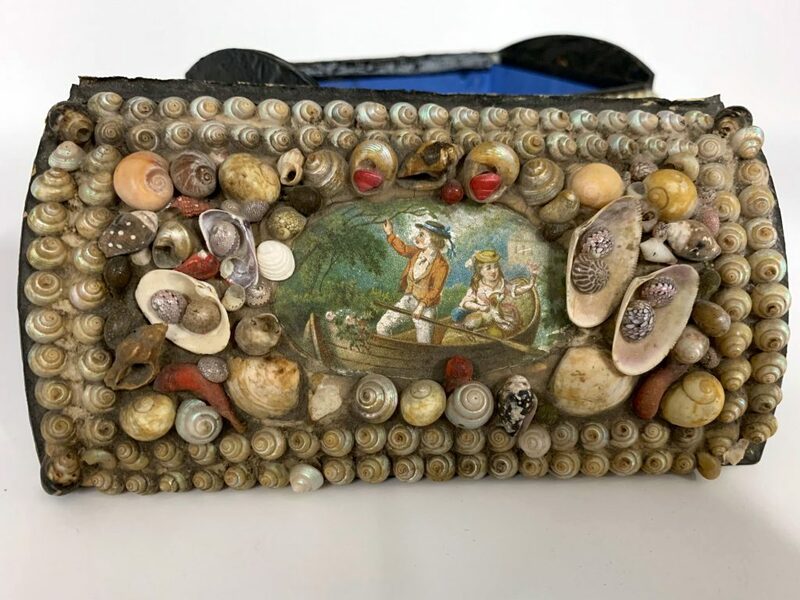 Posted Friday, February 27, 2015 by Katie MeyersinMaine Maritime Museum, exhibit Welcome to the Maine Maritime Museum blog! We are gearing up for the busy summer season, so check back regularly for updates on new programs, tour schedules, special events and more. New this weekend, our latest exhibit, Ingrained: The Art of the Shipcarver, opens in the Kramer Gallery. Ingrained includes some beautiful and rarely exhibited work from Maine shipcarvers, as well as a collection of tools and the workbench of renowned Newcastle carver Edbury Hatch. Among the ornate and interesting artifacts included in the exhibit is this pattern used to design figureheads, which was found in a barn in Bath. Stop by this weekend and be one of the first to view this unique exhibit!